In 2015 the Styrian publishing house Leykam published a book about Austria's most prominent baroque composer, titled Johann Joseph Fux. Leben - musikalische Wirkung - Dokumente, edited by Rudolf Flotzinger, professor emeritus of musicology at the University of Graz. This book, which is a collection of articles by several musicologists on the composer's life and work, is structured in three main sections: 1) Life and work, 2) Compositions and writings and 3) Documentation und interpretation. The chapters dealing with the composer's biography and work ("Leben und Wirken") and the documents related to Fux's life were written by Flotzinger, the chapter dealing with Fux's compositions and writings by a number of other Austrian Fux specialists. The cover of this book is special already, because it bears a different title than the title page inside the book ("Dokumentation" versus "Dokumente"). According to the blurb on the back cover, this book "contains extensive appendices concerning original documents". 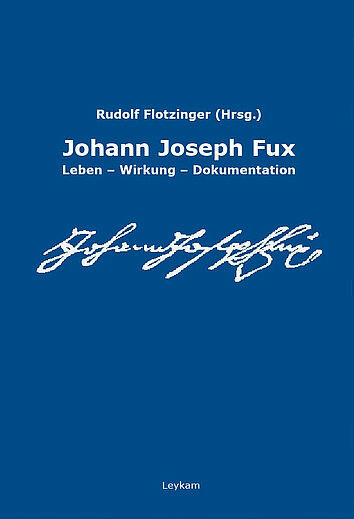 In a twelve-page chapter in the book's appendix, titled "Dokumente zur Biographie" (biographical documents), Flotzinger presents transcriptions of Fux documents dating from between 1680 and 1741. Of course, this collection of documents only leaves an apparent impression of completeness. 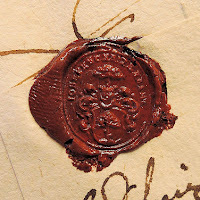 There are too many Fux documents to present all of them, most of which have been published in 1872 in Ludwig von Köchel's book Johann Josef Fux, Hofcompositor und Hofkapellmeister der Kaiser Leopold I., Josef I. und Karl VI. 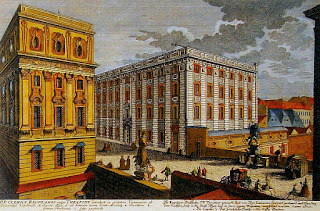 von 1698 bis 1740 (Vienna: Alfred Hölder, 1872). But this basic fact, and the fact that Köchel's edition is not complete, is never addressed in this book and the editor's arbitrary choice of documents is essentially problematic. When I began to do research on Fux documents I planned to write a short piece about the costs of Fux's obsequies. But as I delved deeper into the body of known Fux documents, I realized that I had come across a plethora of unreliable pieces of documentation and flawed transcriptions. Owing to limited paleographic expertise, the available transcriptions of Fux documents contain hundreds of mistakes of which only the most serious can be addressed here. What follows is not a review of the above book. I do not claim to be a Fux expert and I do not intend to delve into Fux's musical oeuvre, or to draw up a list of all the transcription mishaps in the said book's documentary chapter. However, if eighteenth-century sources, on which I profess to have a modest expertise, are mistranscribed or misinterpreted, I dare to take issue. The goal of this blogpost is to present a number of unknown Fux documents, to address the worst mistakes in the edition already published material and to point out directions for future research. Fux's obsequies were carried out with a "wahnsinniger Aufwand" (insane effort). "The Emperor[sic]" paid for the ceremony. "The Emperor" was present at Fux's obsequies. The Court chapel took part in the obsequies. The boy Joseph Haydn took part in the ceremony. The whole chapter of the cathedral attended the ceremony. Apart from the fact that by February 1741 Fux's former employer, Emperor Charles VI had been dead for four months, none of the above claims is tenable. Fux's obsequies were carried out according to the rate of a regular half-price Großgleuth with an additional Requiem, an effort that in 1741 everybody could receive at the Cathedral whose relatives were willing to pay for it. Given that Fux was able to bequeath 10,000 florins to his nephew Matthäus, his relatives certainly did not need the financial support of Maria Theresia to pay for the ceremony. 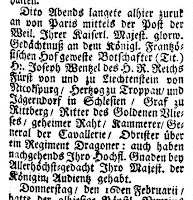 In the evening of 15 February 1741 Maria Theresia was not present at Fux's obsequies, because at exactly that time she was receiving Joseph Wenzel I, Prince of Liechtenstein in audience, who had just returned from Paris. 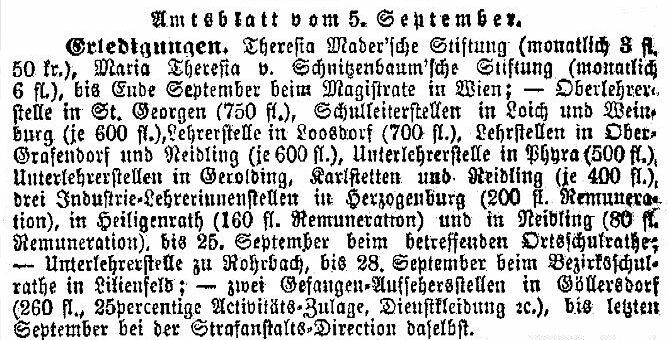 This information was published in the Wiener Diarium, on the same page as Johann Joseph Fux's death notice. The Court chapel did not take part in Fux's funeral ceremony, because its collaboration would only have been allowed in the Cathedral (a premise that was subject to municipal administration), if the Court musicians had performed without pay. 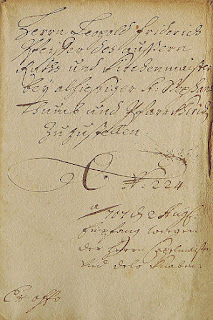 The entry concerning the obsequies of Antonia Caldara in 1736 shows that such a gratis performance was explicitly registered in the Bahrleihbuch (see below). The six Kapellknaben (one of whom at that time was Haydn) never took part in funeral ceremonies that were performed according to the valid Stol-Ordnung (regulation of ceremony fees). They took part in activities of the Domkapelle, such as High Masses on Sundays and feast days. Let me begin with the most important source concerning Fux's obsequies: the entry in the 1741 Bahrleihbuch of the parish of St. Stephen's. The transcription of this entry, which Flotzinger presents in the chapter "Dokumente zur Biographie" (biographical documents), shows that he did not fully understand this source. His transcription is flawed and incomplete. The author of this transcription obviously never saw even one other entry in an eighteenth-century Bahrleihbuch. These entries always begin with the date of the burial (if it was the first on that day) and not with the word referring to the time of day. The word "Nachtbestattung" did not exist at that time. The term that was used was "Nachtbegräbnis" (which actually means "funeral after dark" and not "during the night" as claimed by Flotzinger). 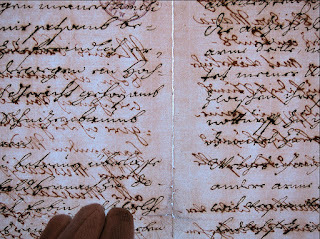 "Krufften" is a well-known misreading of the downward-bent upper horizontal stroke of the "f" as a second letter f. Decades of work with eighteenth-century handwritten documents made me realize that this is only one single letter and that the "double f appearance" is actually a phenomenon of an illusion, caused by a learned visual pattern. The second vertical stroke causes an almost irresistible visual "double f" impression. For more examples, related to this particular issue, see my article A Little Leitgeb Research. A special phenomenon connected with this misreading is the fact that it soaked into contemporary printed sources which are now taken as "proof" that this is a double f.
The word "Kruften" in Fux's Bahrleihbuch entry. This is a single f with the upper horizontal stroke drawn downwards to avoid lifting the pen and to have backswing space for the following t.
The word "Clafter" in a 1744 property register (A-Wsa, Patrimoniale Herrschaften, B106/17, fol. 174r). 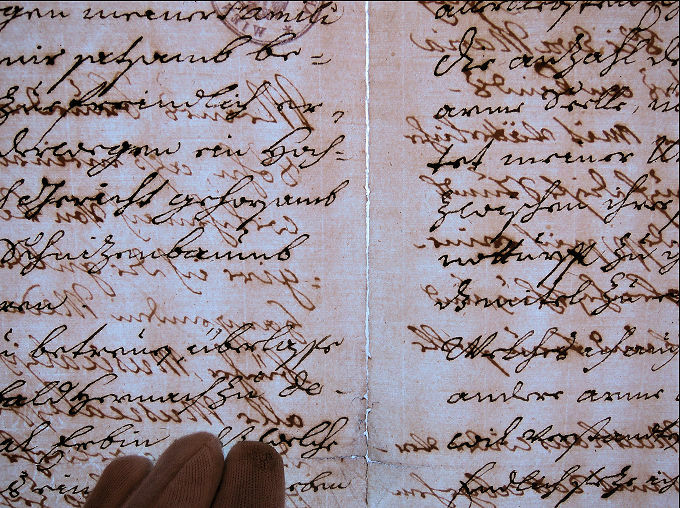 Every example of eighteenth-century handwriting I present in this blogpost stands for thousands of similar examples. Flotzinger always mistranscribes this combination of letters as "fft". 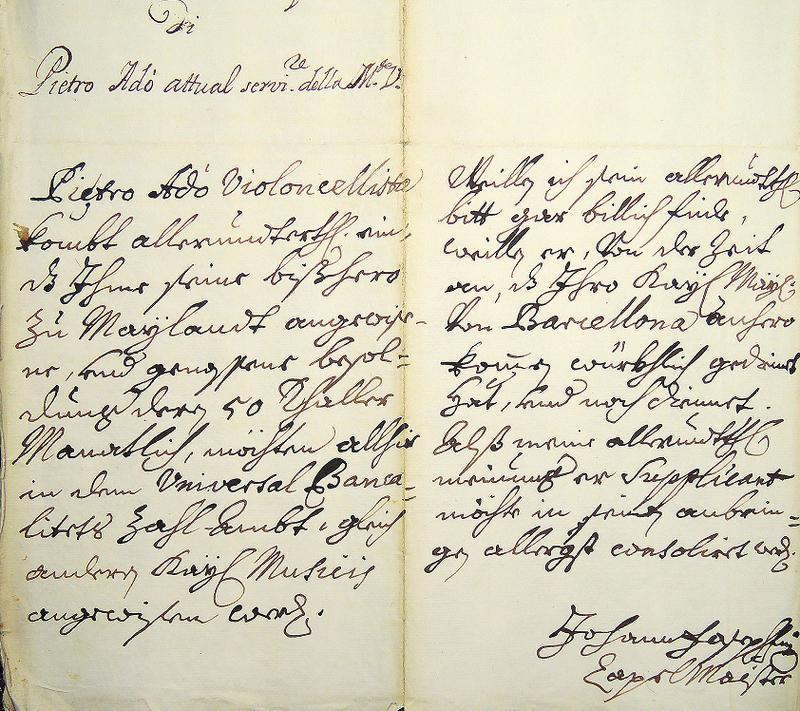 The word "Hofmaisterin" in the entry concerning the death of Princess Maria Theresia von Auersperg in 20 January 1741. Again the horizontal line of the f is curved downward to avoid having to make a horizontal line to the left (A-Wsa, Totenbeschreibamt 42, fol. 184v). 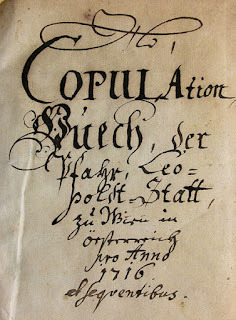 The signature of Gottlieb Muffat on the will of his friend Heinrich Holzhauser, the father of the singer Theresia Reutter. Technically this is a single f and the signature reads "Mufat". I located this signature (A-Wsa, AZJ, Test. 3945/18. Jhdt.) in 2012 for the cover of Alison Dunlop's book The Life and Works of Gottlieb Muffat. 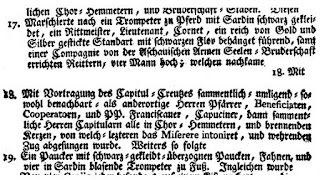 The word "Hofcamerath" in an endowment deed of 1737 (A-Wsa, Stiftungen, A2/5254). The misreading of this single f lead to the origin of the family name "Hoffmann", a profession that does not exist. The most prominent misreading of this single f occurred in the transcription of Johann Sebastian Bach's "Kurzer, iedoch höchstnöthiger Entwurf einer wohlbestallten Kirchen Music" from 1730 which was first published on 10 November 1837 in the Neue Zeitschrift für Musik (Siebenter Band, No. 38). The reading "Entwurff" is simply wrong. Further f-mistranscriptions of Bach's text appear in the words "nothdörfftig", "Wißenschafften", "Beÿhülffe", "begreiffen", and "Guffer". The misreading of a single f as a double f is the cause of countless transcription mishaps in Flotzinger's book. Many of these mistakes are copied from Herwig Knaus's three-volume book Die Musiker im Archivbestand des kaiserlichen Obersthofmeisteramtes (Vienna: VÖAW, 1967-69). The above entry of course reads "Hof-Capellmaister" and "Hectica-fieber" (the latter of which was correctly published by Köchel (Köchel, 288). The note "Motteten mit Sart" in Fux's Bahrleihbuch entry completely mystified Flotzinger. On 15 February . Evening burial. The honorable Sir Johann Joseph Fux, Court Kapellmeister of his late Majesty, the Roman Emperor, was inspected at the Golden Bear on the Old Fleischmarkt as having died of tremorous fever, 81 years of age, [buried] in the crypt of St. Stephen's. Peal of the great bell " 9"41" / canons " 24"―" / curates " 6"―" / shroud " 8"30"/ parish picture " 1"12" / gravesite " 50"―"/ musicians " 10"―"/ motets with muted brass "15"―"/ bier renter and sexton " 3"―"/ sacristan " –"30 / 8 bier setters in coats" 6"―" / 14 cowlboys " 2" 6" / bier "―"45"/ builder and gravedigger " 4"―" / 3 altars " 2"15" / 12 chairs " 3"―" / Peal of the Fürsten bell as peal preceding the Requiem " 4"20" / the Curates " 6"―" / 2 acolytes " 1"―" / subtotal "157"19" / [fol. 36v] florins. kreutzer. / overleaf subtotal "157"19"/ musicians " 15"―" / bier renter and sexton " 2"―" / sacristan "―"30" / 2 cowlboys "―"18"/ 3 altars " 2"15"/ 12 chairs " 3"―"/ shroud and lampstands " ―"30" / total "180"52" / peals at St. Magdalene's and the convent of St. Laurenz / [picture] Pelican. 12 citizens [as cortege]. This entry describes an ordinary "grossgleüth" ceremony with an additional Requiem, preceded by a separate "fürstengleüth". 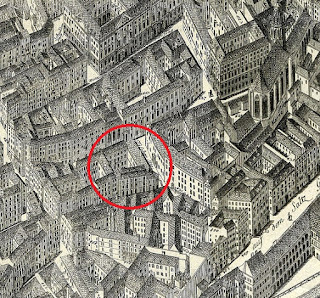 The "peals at St. Magdalene's and the convent of St. Laurenz" (missing in Flotzinger's transcription) refer to St. Magdalene's Chapel south of the Cathedral and the chapel of the convent of St. Laurenz on the Fleischmarkt, close to Fux's last residence. This ceremony was expensive, but it was not "incredibly" expensive. As a matter of fact there were several items that could have raised the price even higher which in Fux's case were not employed, such as a higher count of clergymen, altars (on several consecutive days), more cowlboys and acolytes (at one florin apiece). It was always possible to have a number of altars set up for several days in different apses (with chairs that had to be paid extra), a luxury that could cost more than 80 florins extra. Fux's status as non-noble citizen precluded him from receiving a peal of the "Josephinische Glocke" (the old Pummerin) and the fact that his body was not transferred to the Cathedral in a carriage with six horses – an effort which on 29 June 1742 was applied at the funeral of the architect Joseph Emanuel Fischer von Erlach (A-Wd, BLB 1742, fol. 174r) – exposes Flotzinger's claim of "ein wahnsinniger Aufwand" as gross misunderstanding. There were several obsequies in the Cathedral in 1741 whose efforts exceeded Fux's burial. The most expensive funeral of 1741 was that of Johann Caspar Joseph Kolb von Kollenburg, "Weÿl[and] der K.K. M[ajestät] Unter Stabelmaister" (deputy staff holder of His late I. & R. Majesty), which cost 195 florins and 16 kreutzer. It included a Großgleuth, a tomb in the crypt, a Requiem with a Fürstengleuth, 30 cowlboys and five altars. What makes his funeral significant in regard of the alleged "incredible effort" at Fux's is the fact that the musicians that were employed for Kolb's Requiem cost nine florins more than those that performed in the Requiem of the deceased Court Kapellmeister. The entry concerning the obsequies of Johann Caspar Joseph Kolb von Kollenburg on 13 January 1741 (A-Wd, BLB 1741, fol. 10v and 11r). The expense of 24 florins for the Requiem was extraordinary. This was basically the highest possible cost for exequies in 1741, except for a possible additional peal of the Pummerin and additional altars. The only way to get a factual perspective on the relative costs of Fux's funeral and the effort that it implied, is to compare it to similar ceremonies that took place at that time at the Cathedral. One of the most suitable sources for such a comparison is the entry concerning the obsequies of Fux's wife Clara Juliana on 9 June 1731. Unfortunately this document is not included in Flotzinger's collection of Fux documents. Clara Juliana Fux, née Schnitzenbaum died on 8 June 1731 of internal gangrene at an approximate age of 60 (as will be shown below, she was not born in 1671). Her death was reported on the following day in the Wiener Diarium. This note was already published in 1872 (Köchel, 1872, 295). Neither Köchel nor Flotzinger published the entry in the municipal death records (the Totenbeschauprotokoll) concerning the death of Fux's wife. Den. 8. Junÿ. 731. / Dem Wohl Edl gestrengen Herrn Joh. Joseph Fux, Kaÿ[serlichen] / Hof-Capell-Maistern, sein Frau Clara Juliana, gebohrne / Schnizenbaumin, ist beÿm gold[en] Bärn am alten Fleisch= / marckt an innerlichen-Brand und Seiten-stech[en] b[e]sch[au]t, / alt. 60. Jahr. June 8th, 1731. The honorable and stern Imperial Kapellmeister Johann Joseph Fux's wife Clara Juliana, née Schnitzenbaum was inspected at the Golden Bear as having died of internal gangrene and side stitch, 60 years of age. Also missing in Flotzinger's book is the entry in the regular death records of St. Stephen's concerning Juliana Fux's burial. The entry concerning the burial of Juliana Fux in the regular Sterbebuch of St. Stephen's (A-Wd, Tom. 20c, p. 756). Note the single f in "Hof Capelmaister". d.[en] 9. dito. [Junii] des Wohl Edl gestr:[engen] herr Joseph / Fux, Kaÿ[serlichen] Hof Capelmaisters / seine Frau Julia[n]a, zu St: Ste[phan] / grossgleüth " 6"―" / Requiem " 6"―"
The costs of Juliana Fux's obsequies on 9 June 1731 immediately relativize those of her husband's ten years later. Her funeral ceremony cost 130 florins 10 kreutzer, but, apart from a much cheaper grave, the ceremony included the exact same effort as her husband's. Why did a simple wife of a Kapellmeister receive a grossgleüth with a Requiem? Because her husband was willing to pay for it. The difference of over 50 florins between the costs in 1731 and the costs of Fux's burial in 1741 was mainly caused by the fact that Juliana Fux did not get a grave in the crypt for 50 florins, but only an ordinary one in the cemetery around the Cathedral which only cost a tenth of that amount. Her burial also saw fewer biersetters and cowlboys. No builder for a crypt had to be paid. On the other hand, the music for her Requiem cost even three florins more than the one of the Court Kapellmeister in 1741 (which was probably caused by special musical efforts requested by Fux). 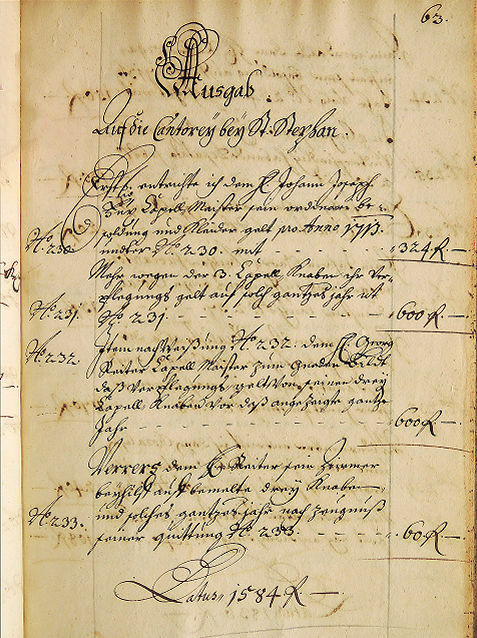 The relation of these amounts – which are starkly at odds with Flotzinger's claim of a unique and "incredible" effort at Fux's obsequies – prove that Fux and his wife were not buried according to their social, but according to their financial status. Compared to most of his colleague musicians, who were holding higher positions (such as Caldara or Reutter), Fux was a very wealthy man. His wealth was based on his annual income of 3,100 fl as of 1715, a one-time gift of 8,000 fl from the Court in 1723 and the fact that beginning in August of 1733 – owing to the extraordinary merits of his uncle – Fux's nephew Matthäus was granted an annual "Scholarengehalt" (court scholarship) of 360 florins (A-Whh, OMeA, Prot. 14, fol. 203v). This important detail is not mentioned in Flotzinger's book. On 9 June . Evening burial. The well and noble-born Sir Johann Joseph Fux, Court Kapellmeister's wife Clara Juliana, née Schnizenbaum was inspected at the Golden Bear on the Old Fleischmarkt as having died of internal gangrene and side stitch, 60 years of age, [buried] at St. Stephen's. Peal of the great bell " 9"41" / canons " 24"―" / curates " 6"―" / shroud " 8"30"/ parish picture " 1"12" / subtotal "49"23" / [fol. 155v] florins. kreutzer. / overleaf subtotal "49"23"/ gravesite at the Fürstenbühel ("Counts' Hill") " 5"―"/ musicians " 10"―"/ motets with muted brass " 15"―"/ bier renter and sexton " 3"―"/ sacristan " –"30 / 6 biersetters with coats" 4"30" / 12 cowlboys " 1" 48" / bier "―"45"/ gravedigger "―"36" / 3 altars " 3"―" / 8 chairs " 2"―" / on the 2nd day the peal of the Fürsten bell was pealed before the Requiem " 4"20" / the Curates " 6"―" / musicians " 18"―" / bier renter and sexton " 2"―" / sacristan "―"30" / 2 cowlboys "―"18"/ 3 altars " 3"―" / 8 chairs " 2"―" / total "130"10" / peals at St. Magdalene's and the convent of St. Laurenz / [pictures] Pelican and St. John of Nepomuk. 12 citizens [as cortege]. 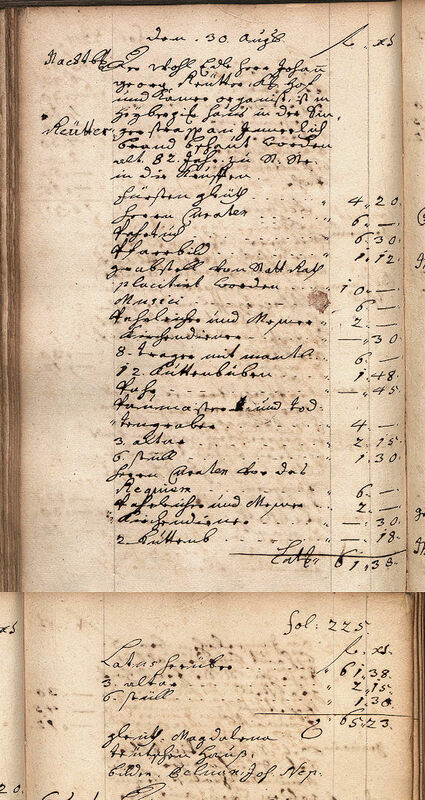 Another document that puts Fux's funeral expenses into a much more realistic perspective (and which is also missing in Flotzinger's book) is the entry concerning the obsequies on 20 May 1749 of the composer's sister-in-law Maria Theresia Schnitzenbaum. Again we are faced with the intention to show off by consecrating an unmarried woman of basically no exceptional social status, but surprisingly large financial means, with a grossgleüth and providing her with a tomb in the crypt of the Cathedral. 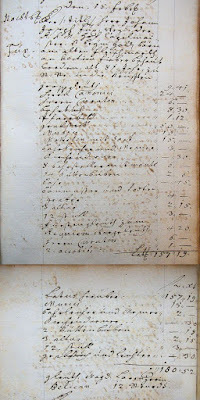 Maria Theresia Schnitzenbaum's ceremony cost 141 florins 16 kreutzer and again included expenses of 30 florins for the clergy, 50 florins for the tomb and 25 florins for the music (again with "Moteten mit Sardin"). The difference of about 40 florins to the cost of Fux's burial was caused by Fräule von Schnitzenbaum not receiving an extra Requiem. 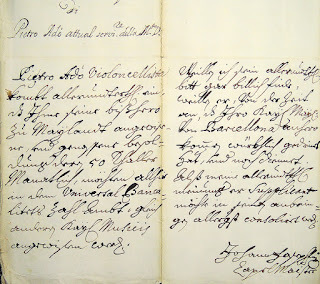 The entry concerning the obsequies on 20 May 1749 of Fux's sister-in-law Maria Theresia Schnitzenbaum (A-Wd, BLB 1749, fol. 80). Again the bells of the churches in the vicinity of the last residence were pealed: at St. Salvator's and Maria Stiegen. Countless entries in the Bahrleihbuch prove that the presumption of Fux having been buried with "incredible effort" has no basis. The sources related to Fux's family alone provide enough documentation to reveal the facts. The burial of Fux's brother-in-law Paul Anton Schnitzenbaum took place on 17 March 1740 at the Cathedral. Although he had only been a k.k. Cammer-Concipist, his relatives again had his burial ceremony performed in style: he received a grossgleüth, 30 florins were paid for the presence of clergymen, 50 florins for a tomb in the crypt and 25 florins for the music which of course included "Motteten mit Sardindl". The entry concerning Paul Anton Schnitzenbaum's obsequies on 17 March 1740 (A-Wd, BLB 1740, fol. 70v-71r). Note again the peal of bells at St. Magdalene's and the chapel of St. Laurenz on the Fleischmarkt. Here are two more entries in the Bahrleihbuch which are of relevance to the assessment of the supposed "extraordinary effort" at Fux's obsequies and Flotzinger's claim that the court requested and paid Fux's funeral expenses. The court organist Georg Reutter the Elder (father of the more prominent composer Johann Georg Reutter) died on 28 April 1738. He received a Fürstengleüth for 4 fl 20 x including a Requiem. The total price of his burial amounted to 65 fl 23 x, a relatively modest effort which was caused by the fact that Reutter had died without leaving any savings. Following a resolution by the City Council the price of Reutter's grave in the crypt of the Cathedral was reduced by 80% to ten florins. 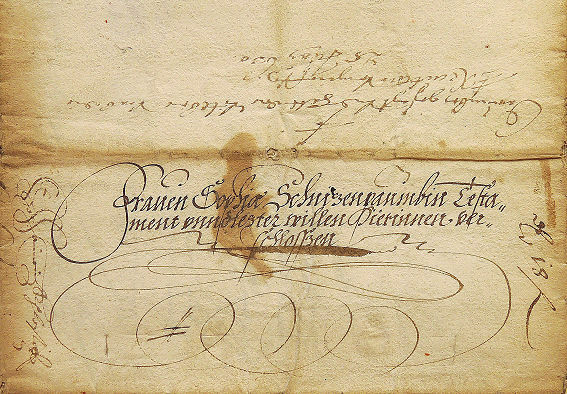 The significant detail is that this discount was recorded in the Bahrleihbuch (and it is recorded in the 1738 Oberkammeramtsrechnung): "Grabstell von Statt Rath placitirt worden" ("the grave was approved by the City Council"). The burial of Antonio Caldara, who for twenty-two years had served as Imperial deputy Kapellmeister, is an interesting case as well. Caldara's obsequies took place on 29 December 1736 at the Cathedral. Although Caldara had drawn an annual salary of 3,900 florins and had received a one-time payment of 12,000 florins (4,000 more than Fux), at the time of his death all the money had been spent and Caldara's widow, his daughter and his mother-in-law, were left in debt. This, and Caldara's artistic merits, were the obvious reasons as to why the musicians of the Cathedral chapel performed free of charge ("Musici gratis") at his obsequies. Of course this gratis collaboration was recorded in the Bahrleihbuch. This would also have been the case, if any members of the Court orchestra had taken part in Fux's obsequies, because these musicians were not permitted to receive payment for activities at the Cathedral within the jurisdiction and financial administration of the Vienna Magistracy. That Caldara received an expensive burial in the crypt was based on the fact that Fux was able to persuade the Emperor (against an earlier agreement) to grant Caldara's widow an annual Gnadenpension (pension of grace) of 400 fl. Although Caldara had drawn a much higher salary than Fux, his burial cost about 100 florins less, which is yet another proof that burial efforts were not determined by "requests and payments from the court", but by the financial means of the bereaved. The Toccata at the beginning of Monteverdi's L'Orfeo is preceded by the following (rarely observed) instruction: "Toccata che si suona avanti il levar de la tela tre volte con tutti li strumenti, & si fa un Tuono più alto volendo sonar le trombe con le sordine." 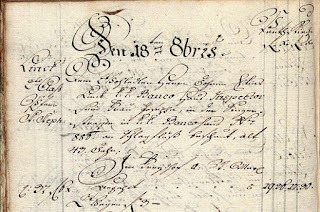 In early 2012 the late musicologist Alison Jayne Dunlop entered into a little fun competition with me on who would be the first to find a Viennese eighteenth-century source that documents the use of the word Sartin as a local term for Surdun. 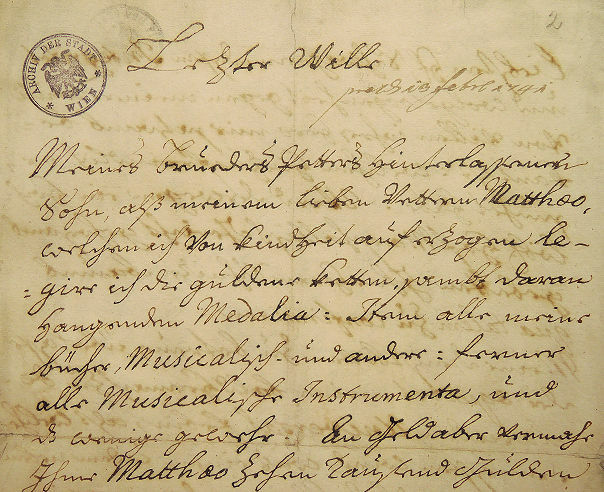 I was eventually able to locate such a handwritten document: on the second page of his will, written on 18 September 1726, the Court trumpeter Tobias Andreas Pernebmer (b. 17 August 1666 in Mauthausen, d. 17 June 1727 in Vienna) addresses the distribution of his instruments and refers to the accessories of his two small brass trumpets. Die Silberne Trompetten gehört der Frau Wittib Catharinæ, welche in dem Kaÿßerl: Hof futter=Ambt kan außgelöst werden, doch ohne Mundstükh, wonit, so kan sie es verkaufen nach ihrem Belieben. Von denen zweÿ kleinen Mesßingen Trompetten, soll ein ieder Sohn eine haben, sambt Mundstükh und Sartin. The silver trumpet belongs to the widow Catharina and can be redeemed at the Imperial Court fodder-office, but without mouthpiece, if not, she can sell it at her convenience. Each son should get one of the small brass trumpets, including mouthpiece and mute. 19. A timpanist with timpani covered with black cloth, with flags and four trumpeters on foot blowing with Sardin. The meaning of the word Sart[in] reveals itself quite easily, as soon as one is willing to read complete volumes of the Cathedral's Bahrleihbücher. 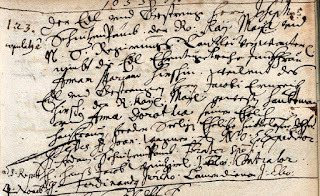 The entry concerning Johann Joseph Fux's wedding on 5 June 1696 at St. Stephen's Cathedral (A-Wd, Tom. 33, p. 85). Flotzinger manages to improve on Köchel's flawed edition, but he repeats some of Köchel's mistakes, or replaces them with new ones. Since the three vertical dashes at the beginning of the entry refer to the three publications of the banns, they must be transcribed. Flotzinger's transcription "copulaty à" is wrong. The apparent letter y in "copulaty" is a common form of the Latin final syllable "-us". The transcription "à" is meaningless. The note on the left reads "copulatus e[st]" (which is proved by thousands of similar entries). The correct spelling of the month is "Junij". The missing genitive case "Mariæ Ursulæ" is essential and the fact that the mistranscription of the final note "Tax. a Scotensibus" already appears in Köchel's edition and is disimproved by Flotzinger into "Test[es] tax[ati] à Scotensib[u]s" ("the witnesses were taxed by the Schotten parish"), does not make it less nonsensical. The dash above the "a" is not a kind of grave accent (in Latin? ), but a common abbreviation sign. The g-like letter at the end of "Scotensibus" is not an abbreviation, but literally means "us". Witnesses of a wedding were not taxed by a parish. The note at the end of the entry reads: "Test[imonium] den[untiationis] a Scotensibus" (i.e. "certificate of proclamation from the Schotten [parish]"). 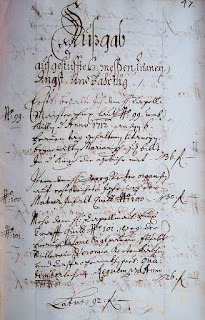 There is another, earlier entry concerning the publication of the banns of Fux's wedding in the records of Fux's home parish (Pfarre Schotten, Tom. 16, fol. 37r) which has also never been published correctly. 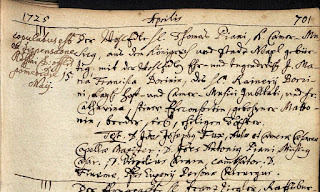 In his smaller monograph about Fux (which was published in 2015 by the Akademische Druck- u. Verlagsanstalt Graz) Flotzinger gives a wrong folio number of this document and again misdates it as having been written "on 4 June 1696", not realizing that this date refers to the wedding date of the preceding entry and thus cannot pertain to that of Fux whose banns had to be published on three consecutive Sundays before 5 June 1696. 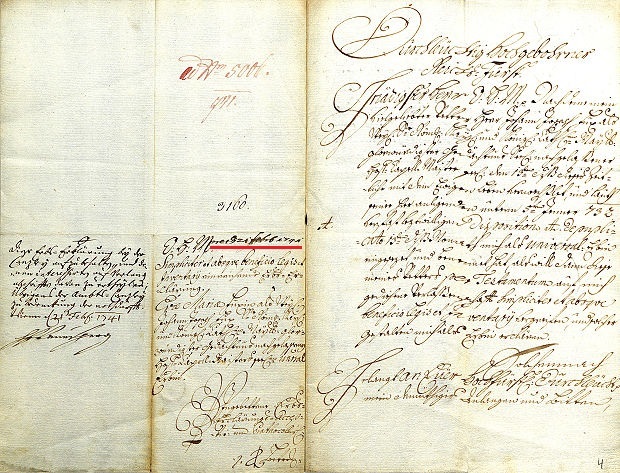 This basic circumstance dates Fux's entry at the Schotten parish to around 20 May 1696 which is also corroborated by the fact that the couple, that was entered into the records right after Fux, got married earlier than the composer, namely on 31 May 1696. Flotzinger also mistakenly claims that the bride's witness Paul Schmuderer "owned a house in the Singerstraße". In April 1702 Schmuderer bought two houses from his brother-in-law: the "Eisgrübel" near St. Peter's and a "Soldatenhäusl" in the Krugerstraße. He did not own a house in the Singerstraße. Fux's will, which the composer wrote and signed on 5 January 1732, was first published in 1872 by Ludwig von Köchel. Köchel, Hochedlinger and Flotzinger (being unable to disengage their minds from modern spelling rules) mistranscribe the headline as "Letzter Wille". 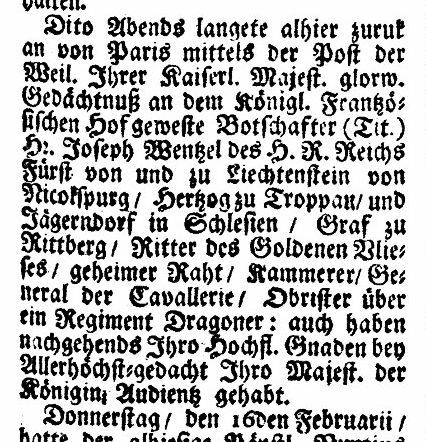 That the important note ("præs 13 Febr 1741"), written right after the headline by the clerk of the Obersthofmarschallamt, is missing in Köchel can be tolerated. But it is also missing in Hochedlinger (70) and silently resolved in Flotzinger (366). Hochedlinger (to name only a few of his many mistakes) turns all capital Ms into small ones, colons into commas, transcribes "Matthæus" as "Matthaeum", compounds the words "zehen tausend" and silently resolves all abbreviations of words and final syllables. On folio 3v of the document, all three editors of Fux's will were unable to pass what I call "the litmus test of eighteenth-century paleography": the correct transcription of the so called "Fahnen-h" which looks like a regular Kurrent "h", but doubles the following consonant. The following phrase reads "In fall aber". It is obvious that Köchel was unaware of this orthographic intricacy which in the second half of the 19th century had already been forgotten. The disappearance of this practice from the public memory led to countless mistranscriptions of German family names, such as "Reihsner", "Bihler" and "Muhm". This particular use of a doubling-h is repeatedly mistranscribed by Hochedlinger and Pangerl in their edition of wills of prominent historical figures int the aforesaid book. 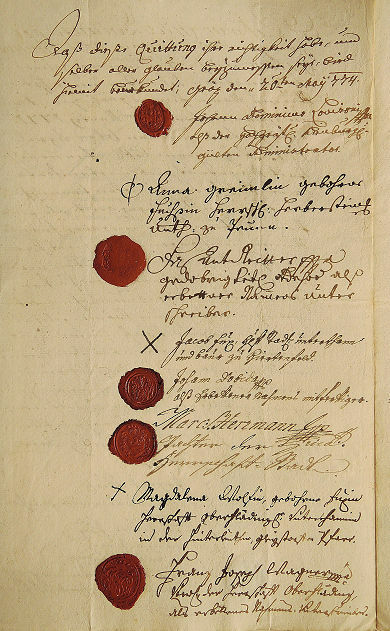 It appears in the wills of Paul Strudel ("genohmen"), Johann Michael Rottmayr ("Fahl", "Todtsfahl"), Georg Reutter the Elder ("einfahlen", "gleichfahls"), and Joseph Emanuel Fischer von Erlach ("genohmen"). Since I have already dealt with the issue of the Fahnen-h in an earlier blogpost, I shall only present three examples here: two double-ls from the 1740s and one of the very rare cases where the "Fahnen-h"actually doubles a following r.
The only word I have found so far, where the "Fahnen-h" doubles an r, is the word "Pfarr" (parish). This way of spelling "Pfarr" and "Pfarrer" appears in the also probate file of Johann Anton Chumar, the parish priest of St. Marein, which is published in appendix II (other sources) of Flotzinger's book. But Flotzinger did not understand this spelling. Probably influenced by Herwig Knaus, Flotzinger continuously misunderstands the eighteenth-century practice of shorenting the German final syllable "-en". 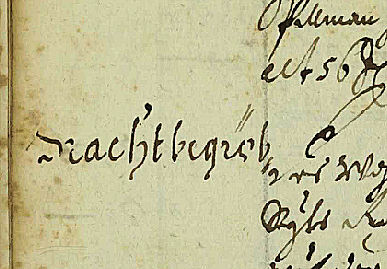 Because he thinks that this common Kürzel is an n without an e, he transcribes the following words (and many others in Fux's will) with an "n" at the end, for example: "zu theilln" and "nach Christlichn". And yet this Kürzel is actually an e without an n, and in the above cases it should be transcribed "theille[n]" and "Christliche[n]". In all three published editions of Fux's will a mysterious comma appears right after the composer's signature. This comma does not exist in the autograph. It is the result of a collective illusion that originated with Köchel: all three authors misread the upward hook of the letter "x" in Fux's name as a comma. 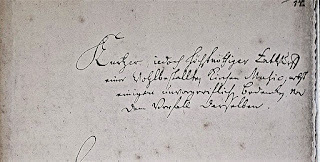 Flotzinger, who, influenced by Köchel, also turns the "ma" at the end of Fux' signature into an "mp", includes the following note after Fux's signature as "angehängter Amtsvermerk". 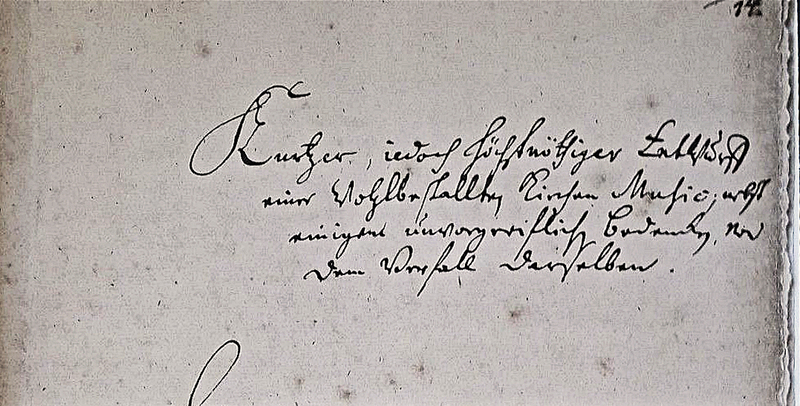 After marring the text with the usual rate of mistakes (wrong are: "Haint", "Matthei", "H. Obrl:", "publiciert", "hievon", "abschrifften", and "ertheilln"), he forgets to include the signature of the Obersthofmarschall, Prince Heinrich Joseph von Auersperg. Like Hochedlinger, he also fails to include Fux's inscription on the outside of the will: "Lezter Wille / mein / Johann Joseph [Fux] / Kaÿl. HofCapelM[aister ma]" (this signature was garbled by paper loss when the will was opened). Fux's will consists of four leaves and is the type of document where the envelope was an integral part of the will and bears handwriting on both sides. Unusual about Fux last disposition is that it bears no signature of a witness. A close-up examination of the original shows that the early paper losses, caused by the opening, were replaced sometime in the 20th century and (with the exception of the seal) the will was fully laminated with 1 g/m² gossamer tissue. This high-quality restoration measure protects the paper and (more importantly) forestalls expectable ink corrosion. Spaced holes in the fold of the paper also show that at some time the document was part of a bound bundle of papers. The area around the seal on Fux's will which shows the section that is not covered by tissue. 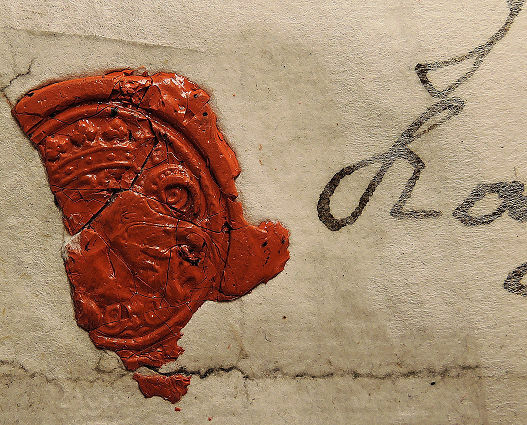 The beginning of the laminated area is clearly visible above the seal and in the flattening of the ink in the letter K. The area left of the seal is an older paper replacement. 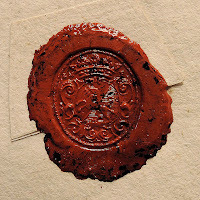 Note the tail of a horse in Fux's seal which will appear again below (A-Wsa, Hauptarchiv, Persönlichkeiten A1. F14, fol. 4r). A backlight shot of the outside inscription on Fux's will which shows the old replacement of the paper loss and the gossamer tissue circumventing the seal (A-Wsa, Hauptarchiv, Persönlichkeiten A1. F14, fol. 4v). 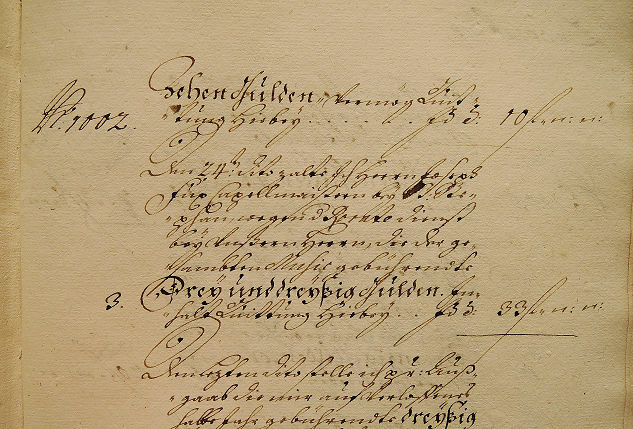 Three documents in the so-called "Zusammengelegte Akten" (merged files, A-Wsa, Alte Registratur, Serie 1.2.1.A1) of the municipal administration from between 1700 and 1759 refer to Fux's employment at St. Stephen's. 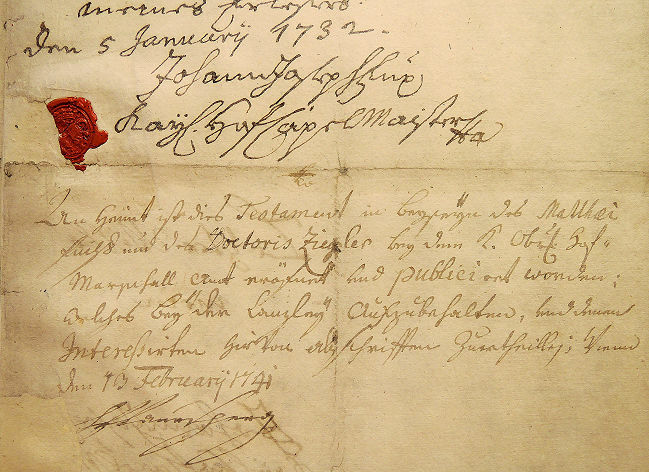 Two of these files are decrees, issued in 1706 and 1707 by the City Council to the Kirchenmeister (the financial administrator of the Cathedral), regarding the distribution and the boarding of the choirboys. One is a complaint from 1714 by the Council that some of the church musicians (and their substitutes) fail to fulfill their duties in the services at the miraculous image of Our Lady of Pötsch. Excerpts of these three documents were already published (without complete shelfmarks) by Köchel. Flotzinger's new edition of these sources claims to be complete, but it is not, and furthermore it is fraught with errors of which some were demonstrably copied from Köchel. Out of many mistakes only the most serious shall be addressed. The following passage in the file A-Wsa, AReg. A1, 153/1706, referring to the replacement of inept choirboys of the Cathedral with six more able ones from the church of the Bürgerspital, was transcribed by Köchel as follows: "Von denen Sachsen[sic], welche in dem Burgerspital instruirt werden, heraussgenomben[sic] [...]". Since it changes the meaning of the sentence, the mistranscription "Sachsen" (Saxons) – instead of the correct and quite obvious "Sechsen" (the six) – is not a minor flaw. How does Flotzinger treat this text and how does he improve on Köchel's version? On p. 58 and 361 of his book he writes: "Von denen Sachsen, welche in dem burgerSpittal instruirt werden, Heraußgenomben [...]". In his transcription of the file A-Wsa, AReg. 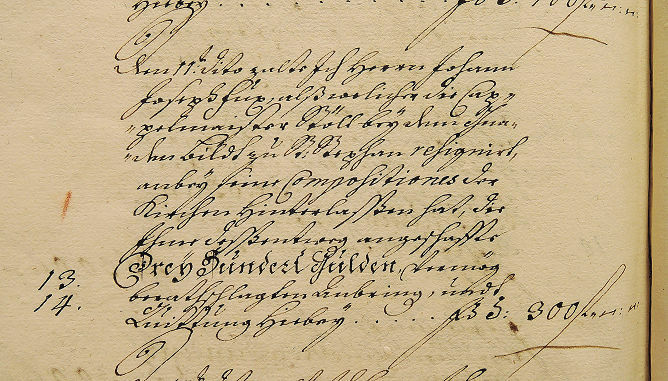 A1, 92/1707 Flotzinger twice misreads the name of the Cathedral's Kirchenmeister Leopold Friedrich Pfeifer as "Pfeister" and at the end of the decree from 1706 the transcription ends with the note "[außen ...]" (outside), but apart from the note "Expedirt den 3ten Jan 707", the text on the file's cover was not considered worthy of publication. The same applies to the file from 1707 whose rubrum also remained unpublished. The cover of the decree from 1707 which so far has escaped publication. Note the Kirchenmeister's correct name being "Leopold Friderich Pfeifer" (A-Wsa, AReg. A1, 92/1707). The so-called Kirchenmeister was the municipal accountant in charge of the Cathedral's budget. Since between 1712 and 1715 Fux served as Essentialkapellmeister at St. Stephen's, the costs of Fux's employment are recorded in the account books of the Kirchenmeisteramt. The series of these records is not complete and furthermore these records represent a special situation, because they have never been united and today are held by three different Viennese archives: 1) the Vienna City Archive, 2) the Domarchiv (the archive of the Cathedral) and 3) the Diözesanarchiv (the archive of the Diocese of Vienna). The years 1712 and 1714 only survive in a preliminary draft versions at the Domarchiv and the year 1715 seems to be lost. 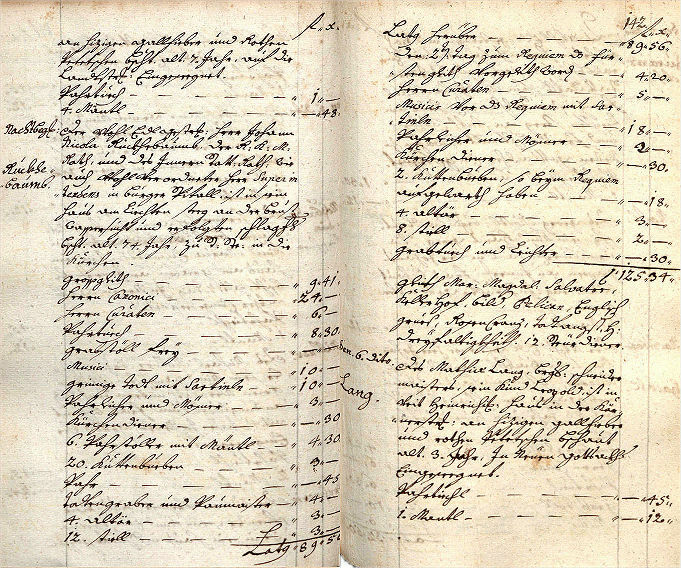 The entries related to Fux always appear in two different sections of the books: first, under "Außgab auf gestüffte Heilige Messen, Litaney, Angst und Jahrtäg" (expenses for endowed Holy Masses, litanies, days of anxiety and anniversaries), and second, under "Außgab auf die Cantorey beÿ S. Stephan" (expenses for the music at St. Stephen's). For six litanies at the Madonna's miraculous image, on six Marian feast days, Fux was paid 36 florins. For each of the four endowed Requiems in 1712, which were celebrated on Ember days, he received 6 florins 30 kreutzer. The first appearance of Fux's name in the 1712 Kirchenmeisteramtsrechnung (A-Wd, Kirchenmeisteramtsrechnung 1712, fol. 47r). The sloppy handwriting marks the draft character of this copy. Will[en] d Anno 1712. An den[en] 6.
beÿm alte[n] Marianisch[en] G[na]d[en] bildt. 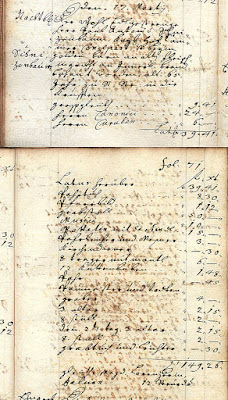 In the section "Außgab auf die Cantorey" the expenses for the musicians are listed. Fux's annual salary at the Cathedral was 300 florins with an additional "Kleydgeldt" (clothing allowance) of 24 florins. For the six choir boys, whom he had to teach and sustain, Fux in 1712 received 1,200 florins per year. As can be seen in my article about Vivaldi's obsequies, these amounts were to remain unchanged for the next 30 years. In 1713 Fux seems to have had his duties at the Madonna's image reduced. Three of the choristers were transferred into the care of Georg Reutter who for these three boys received an additional "Zimmerbeyhilf" (housing allowance) of 60 florins. 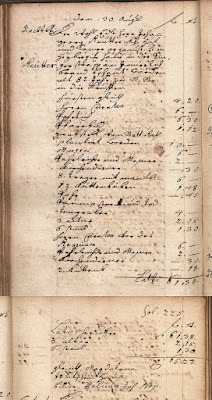 The distribution of the six boys between Fux and Reutter and the payments of 600 fl to each of them is documented on the following page of the 1713 account book. 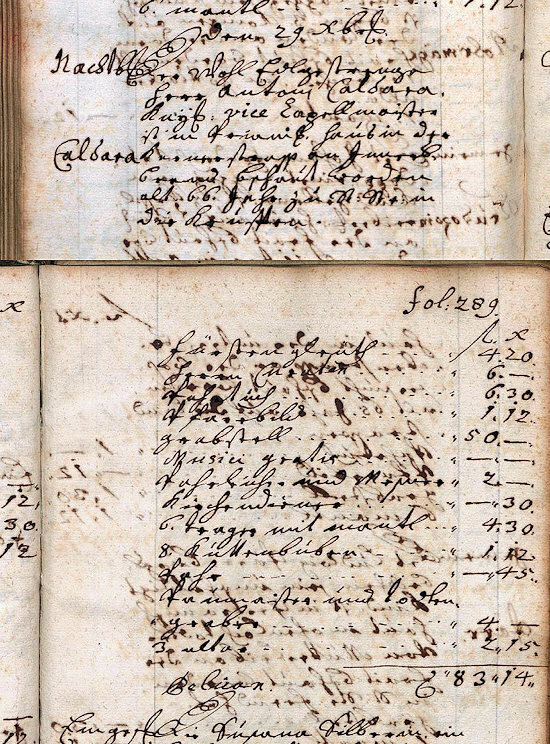 Fux's and Reuter's salaries and compensation fees in the 1713 Kirchenmeisteramtsrechnung (A-Wsa, Handschriften A41/21, fol. 63r). This is a representative final copy. Auf die Cantoreÿ beÿ St. Stephan. In 1713 Fux is also referred to as having examined the work of the Cathedral's music copyist Lambert Graf. A pdf with all entries related to Fux in the Kircheneisteramtsrechnungen from 1712-14 can be downloaded here. The account books of St. Stephen's Cathedral belong to the many historical records that have been sadly ignored by Austrian musicologists. Since it is not possible to publish all fifteen Fux entries in the five account books in question (A-Wsa, OKA Rechn B1/228-232) in a blog post, I shall only provide the shelfmarks and limit the presentation of these sources to a few examples. Between 1705 and 1712 Fux's name does not appear in these records and his service at the Madonna's miraculous image is never mentioned. 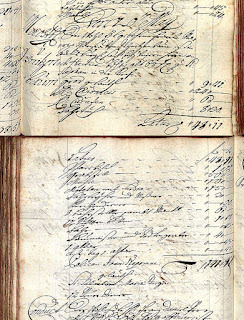 The earliest reference to Fux in the Oberkammeramtsrechnungen can be found in the first account book of 1712 which was the very last ledger that the Ober-Kämmerer Johann Sebastian Höpffner von Brendt (b. 1657, d. 13 July 1712) drew up. 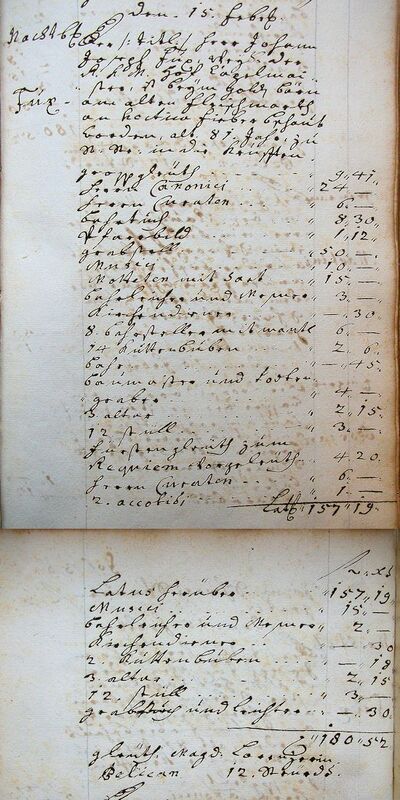 On 11 April 1712 the municipal treasurer paid 300 florins to Fux as compensation for the compositions that Fux had given to the Cathedral when he had resigned from his post as deputy Kapellmeister. On 30 November 1712 the City treasurer paid Fux a half year's fee of 215 florins for the litanies at the Marian column Am Hof. Two pages from the 1712 Oberkammeramtsrechnung. 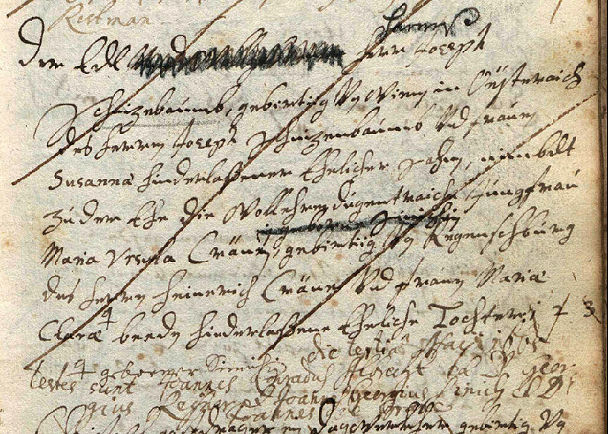 The entry concerning Fux's fee for the 1712 litanies Am Hof is at the lower left and upper right (A-Wsa, OKA Rechn, B1/229, fol. 66v and 67r). On 24 December 1712 the City paid Fux 33 florins for the music at the Rorate service at the Passion altar. 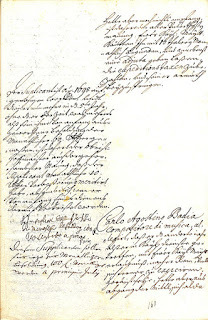 On 19 August 1713 the Oberkämmerer paid Fux 20 florins for the Mass and the Requiem that were held in connection with the obsequies of the councilman Johann Nicola Ruckebaum. The burial of the councilman and superintendent of the Bürgerspital Johann Nicola Ruckenbaum (1639-1713) had taken place on 5 August 1713 at the Cathedral. The information that the City paid Fux 20 florins for the music is an interesting addition to the entry in the Bahrleihbuch concerning Ruckenbaum's obsequies. The City not only paid for the music, but also for the grave in the crypt. The musical items that cost twenty gulden cannot be exactly identified. They could have been the "Musici" for 10 fl. and the performance of "der grimige Todt mit Sartinln" for 10 fl., but the note "für gehaltene Lob: und Seel Ämbter" in the account book suggests that the 20 florins either covered the 18 fl. for "Musicis vor d[a]s Requiem mit Sartinln" (with the remaining amount unaccounted for), or the free musical service is nor recorded in the Bahrleihbuch. The burial services of the two last councilmen are especially interesting, because Fux was obviously still involved in the musical services at the Cathedral in March of 1715, at a time when he had already resigned from his post as Kapellmeister. My research in the account books of the Oberkammeramt is still ongoing. Other references to Fux in these records may yet be found. 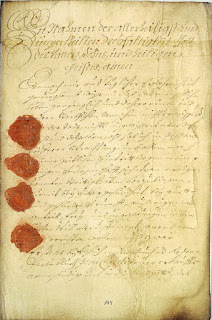 Fux's Erbserklärung in the probate file of his wife Clara Juliana (A-Whh, OMaA, Karton 687, 3454/1731). There is no information in Flotzinger's edition concerning the appearance of Fux's seal and that the signature is autograph. The edition of the composer's probate file from 1741, the second document in the OMaA, is rife with similar problems. Flotzinger publishes the report of the Amtstrabant Paul Anton Bernhard (with the usual mistranscriptions, such as "Hoff" and "vorgenohmen"), but he fails to include the text on the second leaf of the document, i.e. 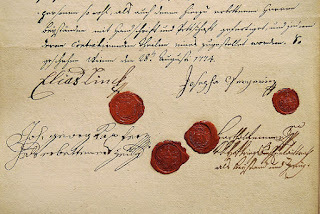 the rubrum and the final note which is signed by the Obersthofmarschall Prince von Auersperg. 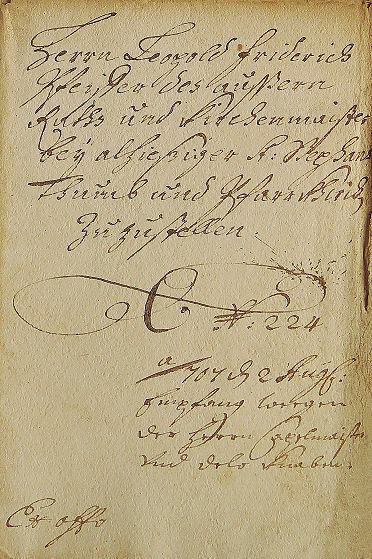 We are presented with the transcription of the Erbserklärung of Fux's niece Eva Maria (with one telling mistake that is copied from Köchel), but the note "[seitlich Vermerk]" (side note) beside the heiress's signature proves that – contrary to the claim on p. 357 of Flotzinger's book – the text is not a transcription of the original document, but a mere copy of Köchel's edition. This alleged "side note" only appears in Köchel (Köchel, 290), but it cannot be found on the second page (fol. 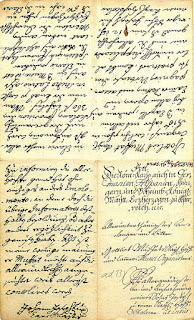 4v) of Eva Maria Fux's original Erbserklärung. In the original file this note is part of a longer entry on a different page of the document (fol. 5v) and it comes as no surprise that the text on this page is missing in Flotzinger's edition. Of course one could claim that these notes contain no important information. But such a negligent approach should not be the rule of a scholarly edition of documents. 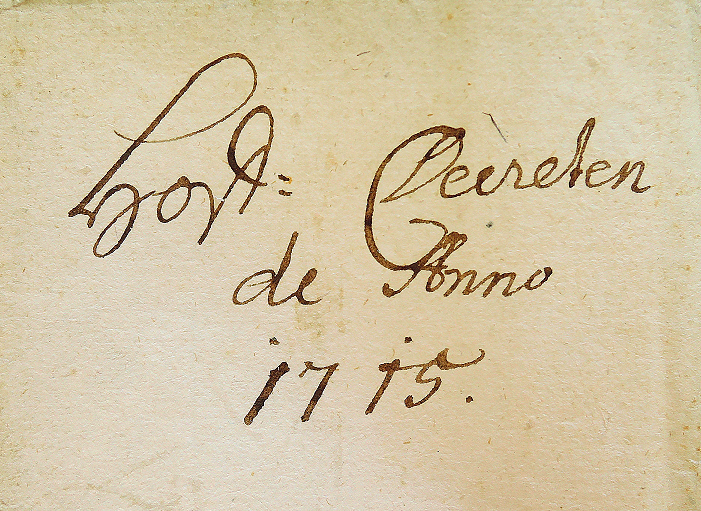 With the exception of the note "præs 21 Febr 1741" (which, as can be seen, is really not a "seitlicher Vermerk" beside a signature) the text on the left half of the following picture has never been published. 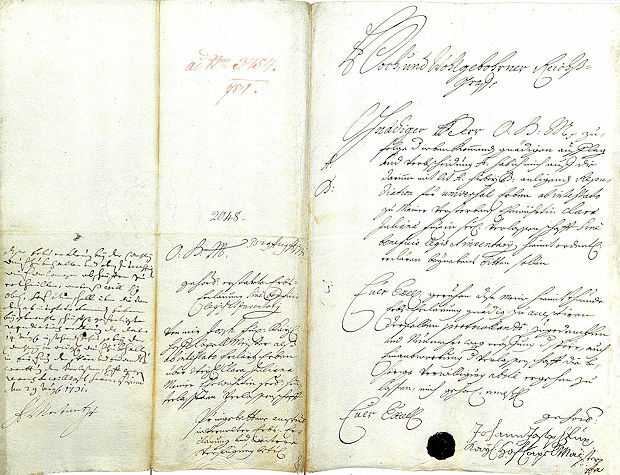 The pages 5v and 4r of the Erbserklärung of Fux's niece Eva Maria Fux. The supposed "note beside her signature" is underlined in red, the signature is not visible, because it is located on the other side of this document (A-Whh, OMaA, 5006/1741). The cover page of Gottlieb Muffat's 1732 application: on the lower right are the address and the rubrum, the rest of the page contains Fux's autograph assessment (A-Whh, OMeA, Alte Akten, Karton 29). For a transcription see Köchel, p. 437. The exact dates that Köchel provides for Fux's statements are mostly arbitrary. Neither the applications nor the assessments bear exact dates. Fux's comments in the files of the Obersthofmeisteramt can be considered the most interesting documents related to the composer's personality. In these written statements, which show great sympathy and are mostly in favor of the musicians' requests, Fux's character comes to life in an uncanny way. That Flotzinger does not include a single one of Fux's assessments in his collection of "documents related to Fux's biography", is surprising. Totally inexplicable however is the fact that he does not even mention the existence of these documents or their earlier publication by Köchel. 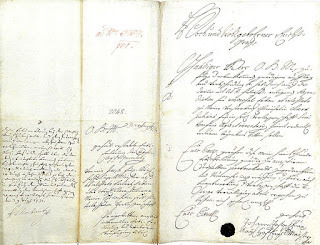 From hundreds of Fux documents in the archive of the Obersthofmeisteramt Flotzinger presents three documents from between 1698 and 1702 that Herwig Knaus already published in 1969. It turns out, however, that Flotzinger also has problems copying printed material, because he adds a lot of curious mistakes to Knaus's texts. The misspellings "Virtzuoso" and "allerdgnädigst" are plain typos, the word "weder" instead of "wegen" (in the protocol of 19 August 1702) is just the result of sloppiness. Knaus's term "seitlicher Vermerk" (side note) for the text on the left side of a two-column document is already problematic. Flotzinger's changing of Knaus's term into the even less applicable "Rand-Vermerk" (marginal note) is just bizarre. It looks as if Flotzinger had never actually seen the original documents. 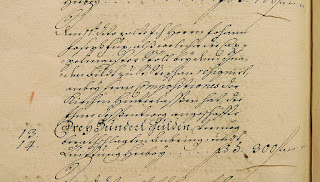 A page of the Obersthofmeisteramt protocol of 19 August 1702 concerning Fux's transfer into full court service (A-Whh, OMeA, Karton 12, fol. 160r). 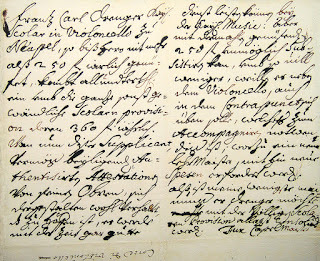 The address to the Emperor and his handwritten decision on the left half of the page are described as "side note" by Knaus and "marginal note" by Flotzinger. 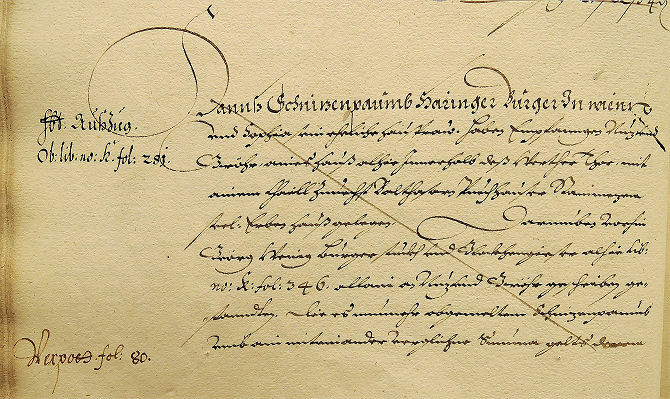 The other three files in Flotzinger's presentation of OMeA files are Fux's applications to the Emperor for gifts of grace from 6 March 1727 (Köchel, 301), 3 January 1727 (Köchel, 304) and 9 April 1733 (Köchel, 307). Flotzinger's edition of these documents – which he mislabels as belonging to the Obersthofmarschallamt (instead of the Obersthofmeisteramt) – are again a mixture of Köchel's old errors, new mistakes and omissions. One is hard pressed not to bore the reader with a list of mistakes that suggest that Flotzinger's texts were not copied from the original sources, but from Köchel's 143-year-old book. The main problem with the presentation of Fux's applications is that for them to make sense they have to be published within their context, i.e. together with the detailed legal arguments on which the final resolutions were based. A case in point is the concert commission's long argument in the report of 29 April 1727 concerning the historical precedents of granting pensions to the widows of Schmelzer, Draghi and Ziani (A-Whh, OMeA, Alte Akten, Karton 23). Lack of space cannot be a reason for not including these important documents in Flotzinger's book, given the fact that in the chapter "Sonstige Quellen" there is enough room for a quote from the 1943 article "Das Weihnachtsgeschenk 1940 des Reichsgaues Steiermark an den Führer" (Flotzinger, 387). In March 1733 Fux wrote a relatively long letter to Count Johann Ferdinand von Lamberg concerning the abilities of the singer Maria Sophia Navetschan and the organ builder Giovanni Moysè. 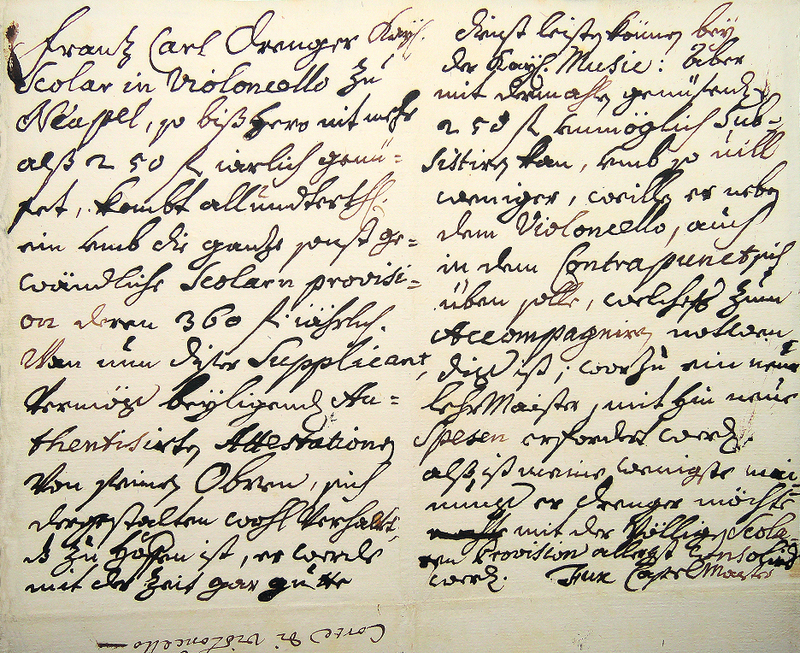 This document, which, apart from Fux's will, is the longest document in the composer's handwriting, does not appear in Flotzinger's book. There is no conceivable reason as to why this letter should not be published in a chapter titled "Documents concerning Fux's biography". 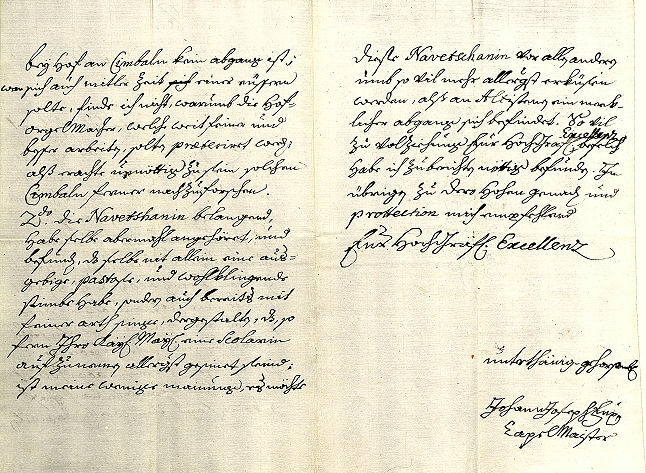 Pages 3 and 4 of Fux's autograph letter to Count von Lamberg which on 6 March 1733 was presented to the Obersthofmeisteramt (A-Whh, OMeA, Alte Akten, Karton 29). For a transcription of this document see Köchel, p. 314f. As far as the documents of the Obersthofmeisteramt are concerned, a lot of work still remains to be done. 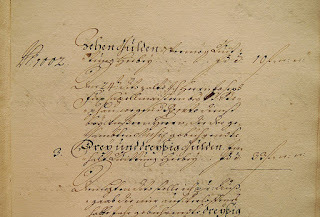 A closer scrutiny of the Obersthofmeisteramt's so-called "Alte Akten" (dating from between 1650 and 1780) shows that the collection of Fux's assessments that Köchel published is not complete. Köchel, in probable anticipation of being criticized for publishing too many sources, only published about two thirds of the handwritten Fux documents from boxes 15-34 of the Obersthofmeisteramt's Ältere Reihe. Since the missing documents have never been published after Köchel, and Flotzinger does not address this bizarre situation, it is obvious that between 1872 and 2016 no Fux scholar ever laid eyes on the archival sources in question. As examples two unpublished Fux documents from the Obersthofmeisteramt shall be published here. 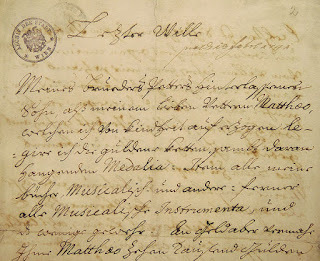 On 4 December 1738 the Obersthofmeister and Fux had to deal with an application from the violinist Tommaso Piani who asked to have his eldest son Carlo Lodovico be granted a court scholarship to receive a singing education. To support his request, Piani referred to his 20 years of service, his seven children and the continuing health issues of his wife and children. Tommaso Piani – who was a younger brother of the violinist Giovanni Antonio Piani (1678-1761) (and not a cousin as claimed by Martial Leroux in MGG2) – was born around 1685 in Naples and 1717 was hired as violinist by the court (Köchel, 367). Fux obviously had a close relationship with Tommaso Piani, because on the occasion of Piani's wedding to Francesca Borrini – a daughter of the court singer Rainiero Borrini (1659-1724) – on 15 May 1725, Fux served as Piani's best man. 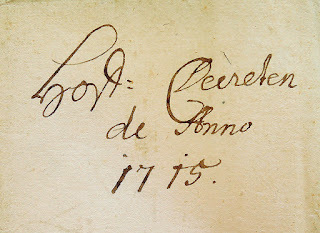 The other witnesses of this wedding were the groom's brother Giovanni Antonio Piani, the Modena-born court chamber accountant Gaetano Virgilio Carrara (1699-1778), and Carrara's brother-in-law Giacomo Fumée, the personal surgeon of Prince Eugene of Savoy. Curiously enough, in 1757, Tommaso Piani was to become the first father-in-law of Wolfgang von Kempelen, the inventor of the chess-playing machine The Turk (Burgpfarre 4, 10f.). The entry concerning the wedding of Tommaso Piani and Francesca Borrini on 15 May 1725 at St. Stephen's (A-Wd, Tom. 44, 701). Giovanni Antonio Piani's date of death is still unknown. My reasearch concerning this unsolved issue is almost finished. After her husband's death in 1767, Francesca Piani was employed by the Court as an I. & R. lady-in-waiting. She died on 3 January 1782 in the Hofburg. Tomaso Piani der Jüngere, in / die 20 Jahr Kaÿl: Musicus Violi= / nista, und Vater von 7 unmün= / digen Kindern, komt allerunterth[äni]gst / supplicando ein, um die Allerhöchste / Gnade, daß sein ältester Sohn Carl / Ludwig, als Kaÿl: Hof=Scolar, in / der Music, und sonderbahr in der / Sing=Kunst, möchte allergnädigst / an= und aufgenomen werden. / Wann nun er Piani, durch 20. Jahr / embsig, und fleÿßig gedient hat, / und wegen so zahlreicher familia, / sowohl, als auch fast unaussezlicher / Krankheit seines Weibs, und Kinder / in grossem nothstand sich befindet; / alß würden Ihro Kaÿl: Maÿl: nicht / allein ein grosses Werkh der / Barmherzigkeit thun, wann Aller= / =höchst dieselbe den Supplicanten mit / der, für ernant= seinen Sohn, aller= / =unterthgst ansuchenden Hof= Scolarn= / stelle, und der gewöhnlichen Scolarn= / Provision, deren jährlichen. 360 f: / allermildest zu begnaden geruheten; / sondern es würde auch Ihro Maÿl: / mitler zeit |:weilen der Knab von / einem treflichen talento ist, und / die beste Hofnung von sich giebet :| / ein guter Virtuos zuerwachsen. Johann Joseph Fux, / CapelMaister. The many unpublished Fux documents among the files of the Obersthofmeisteramt are not the only problem that is apparent in connection with Flotzinger's collection and its fictitious completeness. In theory, the entries in the protocols of the OMeA are mere copies of the presentations (Referate) in the files that cover the sessions. But a scrutiny of the presentations shows that this is not the case and these sources contain additional information that is also waiting to be published. Several details in this fragmentary genealogical outline immediately draw attention: the unspecific dates of birth of the family members prove that Köchel never checked any baptismal records of Viennese parishes. What was Köchel's source for the identity of the grandfather of Fux's wife Josef Schnitzenbaum and his two marriages? What was the source for "19 September 1664" as Josef Schnitzenbaum's date of death? How did he know about the existence of Josef Schnitzenbaum's two other children, Johann Georg and Anna Maria? Of course Köchel did not give his sources and in 1872 he was not obliged to do so. But it is rather surprising that in the following 143 years no Fux scholar ever tried to answer these questions. Many authors simply chose not to address these issues at all and, instead of trying to find answers, simply ignored this topic of research. Biographical research concerning people who lived in Vienna in the seventeenth century is aggravated by the scarcity of sources. There are only fragmentary series of probate files in the archives of governances and because at some point 33 earlier volumes were destroyed, the municipal death records only survive from 1648 on (with a 26-month gap between 1656 and 1659). The church records (especially the death records) are not complete and have unreliable indexes which sometimes are sorted according to first names. 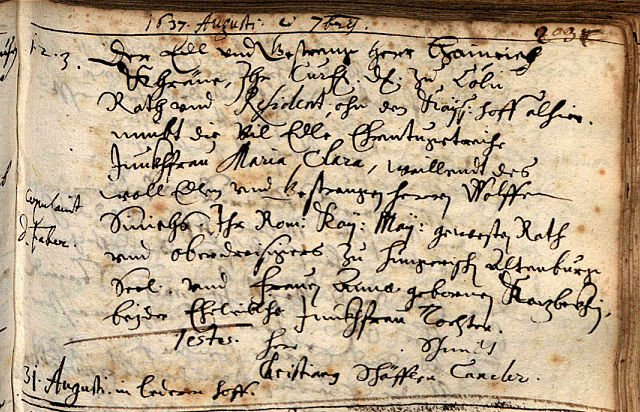 Biographical information from the early seventeenth century can basically only be obtained from four types of archival material: 1) church records, 2) wills in the holdings of the old municipal civil court and various other dominions, such as the Obersthofmarschallamt, the Schotten, the Bürgerspital or the Domkapitel (these wills are very scarce, but probate files are even rarer), 3) records of the municipal financial administration, such as the accounts of the Oberkammeramt (beginning in 1424) or the Steueramt (as of 1500), and 4) municipal property registers of which the earliest date from around 1300 (but these sources are of course are limited to owners of real estate). Because of this difficult source situation, several missing biographical dates of members of the Schnitzenbaum family are unlikely to ever be determined. The earliest appearance of the family name Schnitzenbaum (Schnizenpaumb, Schnitzenpämer) in a Viennese source occurs in 1616. On June 5th of that year, Hans Schnitzenbaum, a fellow (Geselle) from Hall in Tirol, married Sophia Eisang. Sophia (born around 1575), daughter of the furrier Anton Kurz, was the widow of the stone accountant ("Stainschreiber") and former trumpeter Elias Eysang, whom she had married on 15 July 1598 in Vienna (A-Wd, Tom. 8, fol. 87r). 1.2.3. / Cop:[ulatus] 5 Junij / Der Erbar und fürnemb Hanß Schnitze[n]= / Pämer, von Hall auß Tirol ein ledige[r] / gesell, nimbt fraue Sophia, weilland / Herrn Eliaß Eÿsanngge[ns] Khaÿl: / Stainschreibers hind[er]lass:[ene] Wittib. 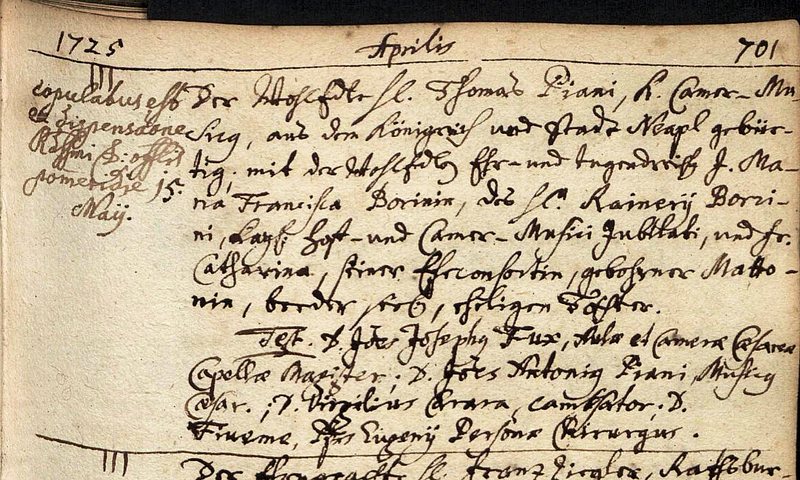 Hans and Sophia Schnitzenbaum turn up in the sources again in August of 1625, when they bought the house Stadt No. 215 (on today's area of the Concordiaplatz) at the corner of Tiefer Graben and Salzgries, which at that time, of course, bore no number, and in the land register was described as "ein Hauß alhier Innerhalb deß Werther Thor, mit ainem thaill zunechst Balthasar Puchhauser Stainmezen seel: Erbns Hauß gelegen". By 1625 Hans Schnitzenbaum was a "Haringer" (herring vendor) by profession and "out of conjugal love and faithfulness" he shared the ownership of the house with his wife ("Welcher alßdann sein Hausfrau Sophia, auß Conlicher Lieb und Threu, neben ihme an Nuz und Gewör schreiben lassen"). 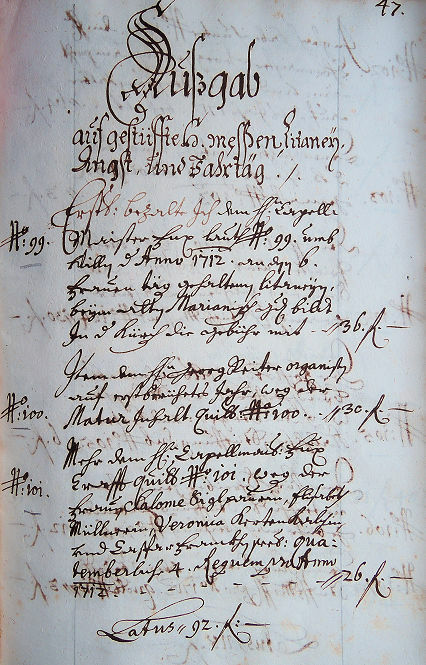 Because the municipal death records only survive as of August 1648 and the death records of the Schotten parish only as of 1649, Sophia and Hans Schnitzenbaum's dates of death can only be conjectured from other sources. Sophia Schnitzenbaum died in 1630, because her will – written on 22 August 1626 – was submitted to the court on 25 June 1630. At that time the Schnitzenbaum couple seems to have still been in good financial standing. 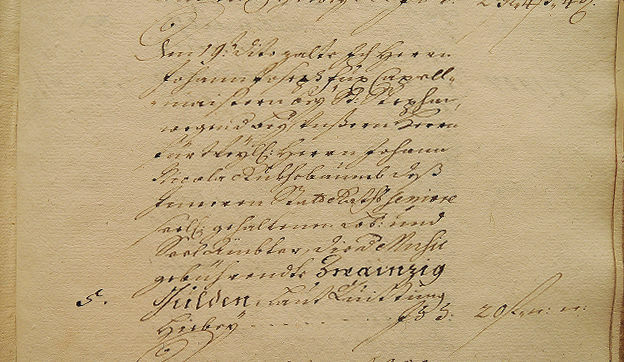 In her will Sophia Schnitzenbaum decreed various charitable bequests, she refers to a house in Penzing and vineyards that she owned, and bequeathed 600 florins, silverware and linen to Maria Jacobina Schmitmaier, a daughter from her first marriage. Each of the five witnesses of her will received a gold ducat for their service. Especially touching in Sophia Schnitzenbaum's will is the passage where she writes "I wish to be buried in the cemetery of St. Stephen's, beside the morgue where the large linden tree is and where all my friends are buried". 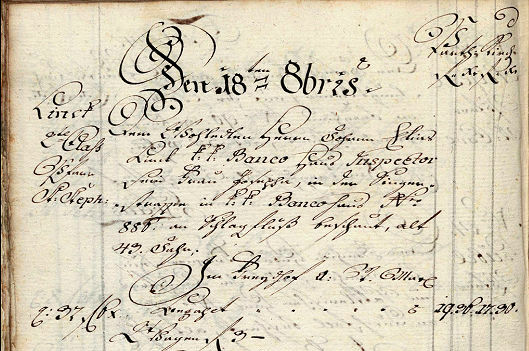 The following events are only documented in a copy of a report of a municipal Raithandler (administrative accountant), which only on 22 June 1660 was copied into the land register, on the occasion of a later sale of the house. Hans Schnitzenbaum died before 1633. Because his estate was insolvent, it was put under sequestration. The house remained unsold which led to tax debt, loss of rental revenues and the desolation of Schnitzenbaum's vineyards: "in deme nicht allein, die Weingarten ungepauter gelegen, undt in merckhliche aböedtung gerathen, sondern auch engestangezogenes Hauß, durchgehendt Lähr verbliben, undt kheinen Zinns ertragen, hingegen, von dem darauf gehaften Saz: deßgleichen, über dreÿhundert Gulden, im ausstandt sich befundtenen Steuern, die Interesse täglicher fortgelofen, undt also disorths, denen sambentlichen interessierten ein mehrerer schaaden zuegewachsen" (A-Wsa, Patrimoniale Herrschaften, B1/15, fol. 602). 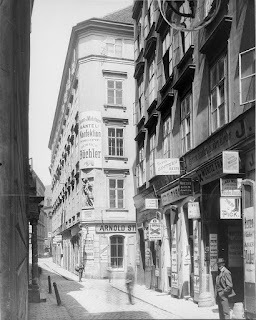 To avoid more damage to the interested parties, on 1 October 1633 the house was sold ex officio by the City Council to a butcher from St. Ulrich. 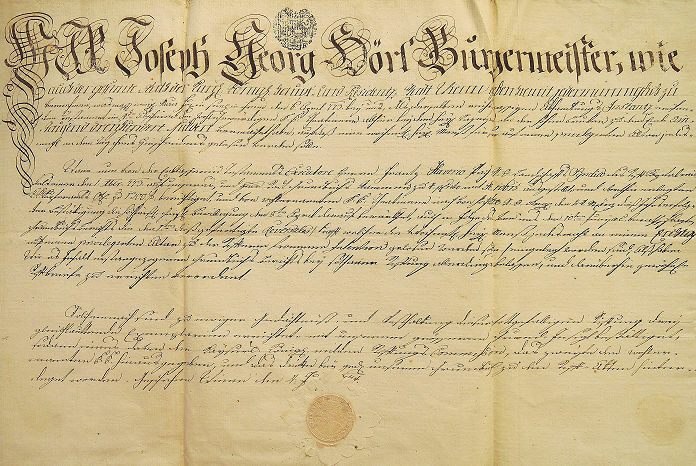 Owing to the lack of a will and a probate file, Hans Schnitzenbaum's family relation to Joseph Schnitzenbaum (the grandfather of Fux's wife) cannot be determined. 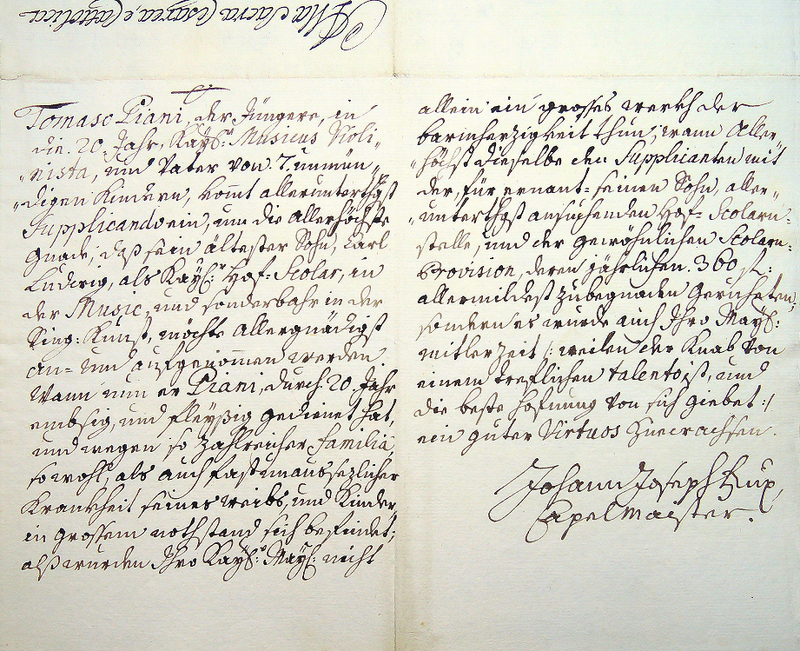 Another likely relative of Clara Juliana Fux could have been the Veith Schnitzenbaum who in August 1650 – according to an entry in the municipal Oberkammeramtsrechnung – paid an acceptance fee of two florins in the course of being appointed a Viennese Bürger. Because of missig sources, biographical information concerning the grandfather of Fux's wife, Joseph Schnitzenbaum, is difficult to ascertain. The dates and location of his birth and two weddings have yet to be located. The pivotal source related to his life is his will which he signed on 31 May 1662. The date "19 7bris 664", written on the envelope of this document, was Köchel's source for the supposed date of Joseph Schnitzenbaum's death (Köchel, 294). 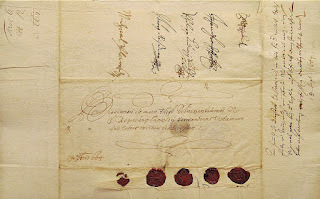 The envelope of Joseph Schnitzenbaum's will, bearing his and his four witnesses seals and signatures. The date "19 September 1664" appears twice: left of the seals and at the end of the note on the right margin (A-Wsa, AZJ 7609/17. Jhdt.). Joseph Schnitzenbaum's will can be summarized as follows: After eighteen years of government service Schnitzenbaum's annual salary as "N:Ö: Regierungs Canzleÿ Verwandter" (Lower Austrian Government official) was 278 florins. For his burial at St. Rupert's Church he bequeathed fifteen florins. With his second wife Anna Maria he had a small son, named Johann Richard, to both of whom he bequeathed his Gnadengeld of 300 florins in equal shares, his small amount of silverware and all his "Vahrnuß" (movables). From his first marriage with Susanna, three children were still alive (a son Johann Leonhard, born on 18 March 1640, had already died in May 1641): Johann Joseph (Fux's future father-in-law), Johann Georg and Anna Maria (b. 28 July 1635), to whom he still owed their mother's inheritance of 100 thaler. This debt was to be covered with the 1,026 florins that Schnitzenbaum had deposited with the Lower Austrian government. He appointed the three children from his first marriage universal heirs of his remaining assets, but since these three children had already received a major inheritance from their mother, and their nourishment, sustenance, education and other expenses had cost him a lot ("sie mich mit ernehr. und nothwendiger underhaltung, studire[n], und andere[n] aufwendtunge[n] nit wenig gecostet"), he requested them to cover all immediate expenses and observe his bequest to his wife and his youngest son. A very special feature of Joseph Schnitzenbaum the elder's will is the fact that it contains handwritten personal requests to the four witnesses who were the following individuals: the government official Philipp Ludwig Rinkhensatl, the surgeon barber Michael Planckh, the salt accountant and member of the Citizen Council Johann Georg Reißner, and the mayor of Bruck an der Leitha, Johann Fronhofer. Köchel (or his assistant) did not understand the meaning of the date on the envelope of Schnitzenbaum's will. It does not refer to the date of death, but to the date the will was presented to the civil court. Joseph Schnitzenbaum already died on 28 July 1664 at the "Marinisches Hauß auf der Fischerstieg[en]". The cause of death was a stroke, his age is given as 58. As he had requested in his will, Joseph Schnitzenbaum, in the evening of 28 July 1664, was buried in St. Rupert's Church. His Kleingleuth cost 11 florins 42 kreutzer. 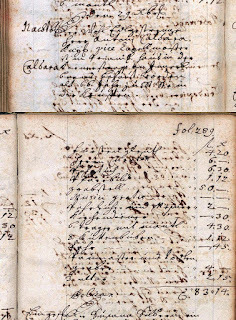 The summation in the Bahrleihbuch concerning his burial is not correct, because two "Pueben mit Kutten" did not cost 54, but 18 kreutzer. For the calculation in the records to be correct, there must have been four cowlboys, costing 36 kreutzer. The entry in the Cathedral's Bahrleihbuch concerning Joseph Schnitzenbaum's burial at St. Rupert's Church: "Der Joseph Schnizenbaumb im Marinischen Hauß auf der Fischerstiegen ist am schlaag bsch. alt 55 Jahr / Nachtbegröbnus. In der Kirchen St. Rueprecht". The text at the lower left refers to the next burial (A-Wd, BLB 1664, fol. 83v). On 25 November 1664 Joseph Schnitzenbaum's widow Anna Maria married Wilhelm Franz Hirsch von Hirschfeld, an army lieutenant stationed at the Castle of Raab (A-Wd, Tom. 23, fol. 52r). Joseph Schnitzenbaum died at the "Marinisches Hauß" which in 1770 was to be numbered Stadt 455. In the second half of the seventeenth century this building was named after the lawyer Marini de Thomasis who had bought it in 1652. In 1689 the house was sold to Maria Elisabeth Koch von Adlersperg which led to its being misnamed "Adelsburgisches Haus". In some sources this house is also referred to as "Bei Unsern Herrn" (A-Wd, BLB 1703, fol. 161r). The "Marinisches (later Adelsburgisches) Haus", Stadt No 455 (last No. 378) at the corner of the Salvatorgassel and the Fischerstiege, on Joseph Daniel von Huber's 1778 map of Vienna. On the upper right is the church of Maria am Gestade. In this house members of the Fux and the Schnitzenbaum families are documented to have lived between 1664 and 1773. In 1749 Fux's sister-in-law Maria Theresia Schnitzenbaum died there and so did Fux's niece Maria Fux in 1773. A view into the Salvatorgasse towards Maria am Gestade in 1907: visible on the far left is the portal of the St. Salvator, the building in the foreground is the "Adelsburgisches Haus", Salvatorgasse 8 (A-Wn, ST 2578F). The special, previously unknown, significance of the "Adelsburgisches Haus" for the history of music is based on the fact that on 3 March 1766 Joseph Sonnleithner, the co-founder of the "Gesellschaft der Musikfreunde" and librettist of Beethoven's Fidelio, was born in this house. Johann Joseph Fux's father-in-law Johann Joseph Schnitzenbaum was born around 1631. Like several other sources concerning the Schnitzenbaum family his baptismal entry turned out to be untraceable. Only four of his siblings could be located in the records of the Cathedral: Anna Maria, b 28 July 1635 (A-Wd, Tom. 11, fol. 243v), Johann Leonhard, b. 18 March 1640 (A-Wd, Tom 13, fol. 289r), Joseph, d. May 1641 (A-Wd, Tom. 9, p. 13). An elder brother named Adam officiated as best man at his brother's first wedding. Johann Joseph Schnitzenbaum was married twice. On 4 November 1653, at St. Stephen's Cathedral, he married Anna Maria Hirsch who may have been a relative of the second husband of Schnitzenbaum's stepmother. With his first wife Johann Joseph Schnitzenbaum is documented to have had two sons: 1) Johann Ferdinand, born on 9 June 1655 (A-Wd, Tom. 22, fol. 154v) and Johann Richard, born on 21 June 1657 (A-Wd, Tom. 23, fol. 9r). Baptisms of other children from this marriage have yet to be found in the records. Schnitzenbaum's second wedding took place on 3 May 1665 at Vienna's St. Michael's Church. 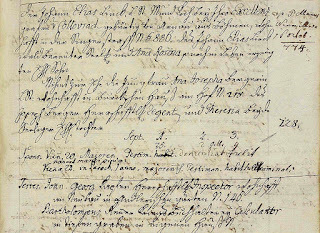 The entry in the church records concerning the publication of the banns for this wedding contains previously unknown information about Johann Joseph Fux's mother-in-law Maria Ursula Crän. 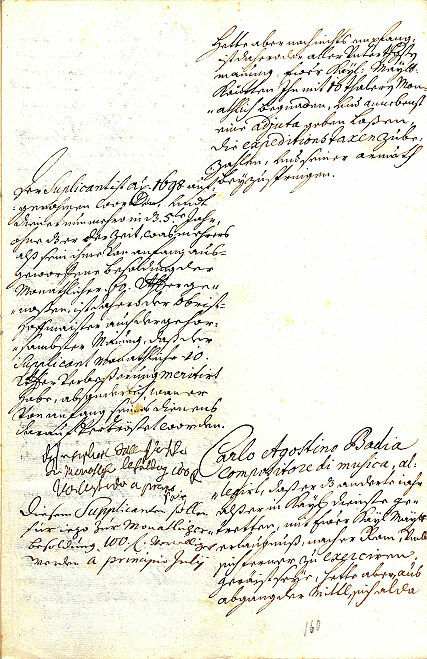 Together with the entry concerning the marriage of her sister Maria Catharina Crän to the Lower Austrian Landschafts-Expeditor Adolph Cremer on 11 February 1665 (A-Wd, Tom. 23, fol. 69v), this entry in the Verkündbuch of St. Michael's is the most important source regarding the maternal ancestors of Fux's wife. Fux's mother-in-law Maria Ursula Crän was born in Regensburg, daughter of Heinrich Khräne (Crän, Krane), Doctor of Canon and Civil Law, counselor and resident of the Electorate of Cologne at the Vienna Imperial Court, and his wife Maria Clara, née Sinich. At the time of Maria Ursula Crän's wedding in 1665, both her parents were already deceased. The entry concerning the publication of the banns in April 1665 for the wedding of Fux's parents-in-law (A-Wstm, Verkündbuch 4, p. 219). These entries were crossed out after the wedding had taken place. The noble Mr. Hans Joseph Schnitzenbaum, born in Vienna in Austria, son of Joseph Schnitzenbaum and his wife Susanna, takes as wife the honorable and virtuous maiden Maria Ursula Crän, born in Ratisbon, legitimate daughter of Heinrich Crän and Maria Clara, née Sinich. The banns published on May 3rd, 1665. The witnesses are Johann Conrad Albrecht, Georg Reisner, Johann Georg Sinich and Johann de Grane. The actual entry concerning this wedding in the regular marriage records of St. Michael's contains only a fraction of the above information. The wedding of Heinrich Khräne and Maria Clara Sinich, the maternal grandparents of Johann Joseph Fux's wife, had taken place on 31 August 1637 at St. Stephen's Cathedral. 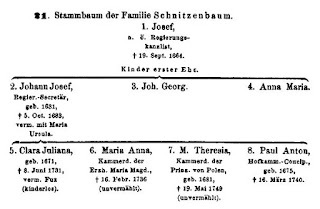 Not all entries concerning the baptisms of Johann Joseph Schnitzenbaum's children can be located in the church records which is the reason why the exact date of birth of Fux's wife will probably never be known. Instead of openly addressing the inaccessibility of this important source, the Fux literature has so far treated this issue as if it did not really matter. 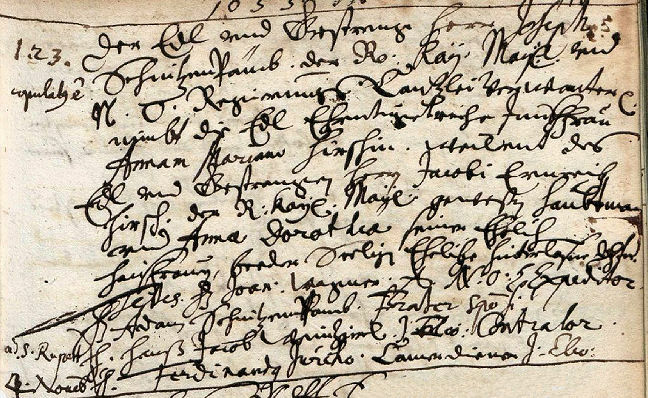 That several sources concerning births and weddings of members of the Schnitzenbaum family are untracable (especially telling is the missing baptismal entry of Paul Anton Schnitzenbaum from around 1675), suggests that this family had several religious ceremonies performed in a quasi private setting at St. Rupert's Church. Another explanation would be flawed indexes in several of the Cathedral's baptismal registers (Tom. 29 and 31-34), but such a scenario is extremely unlikely. 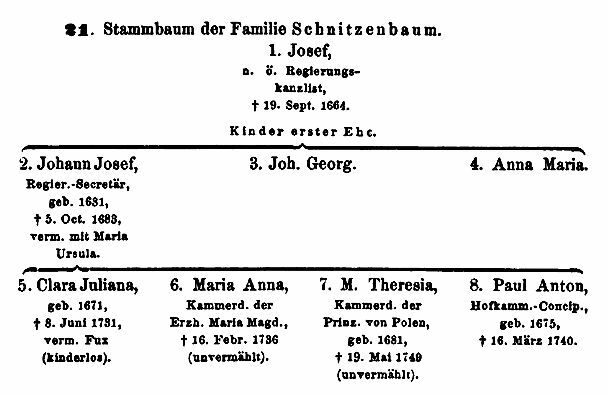 From Johann Joseph Schnitzenbaum's second marriage nine children can be documented. The births of Joseph Adam Schnitzenbaum in June 1670 and that of Jacob Ignaz in July 1671 prove that their sister Clara Juliana (Fux's wife) cannot have been born in 1670 or 1671 (the latter of which is generally given as her year of birth in the Fux literature). The godparents of the seventh child, Maria Maximiliana Schnitzenbaum, were Countess Maria Maximiliana von Collalto, née Countess von Althann and her second husband Count Anton Franz von Collalto (1630-1696). The godparents of the six other children (and most likely also of Clara Juliana and Paul Anton) were Adam Dores and his first wife Anna Maria. Because Dores was employed as accountant of the Moravian county administration in Brno (A-Wd, Tom 28, p. 335), he was sometimes substituted as godfather by the Salzburg-born barber Johann Michael Kreitzthaller and his wife Regina, or assisted by Georg Reisner and his wife Ursula Rosina. Adam Dores left a mark in the history of Moravian geology when in the 1660s he was the first to describe the Macocha Gorge north of Brno. Johann Michael Kreitzthaller was a brother-in-law of the ironmonger Paul Schluderer who in 1698 was to serve as witness at Fux's wedding. The ironmonger Georg Reisner in 1658 and 1676 officiated as best man at both of Paul Schluderer two weddings (A-Ws, Tom. 8, fol. 190r. A-Wd, Tom. 25, p. 112). As of 20 February 1650 (A-Wd, Tom. 19, fol. 130r). Reisner was married to Ursula Rosina Schnitzenbaum, a cousin of Johann Joseph Schnitzenbaum (her parents had been Joseph Schnitzenbaum's brother Adam and his wife Lucia). 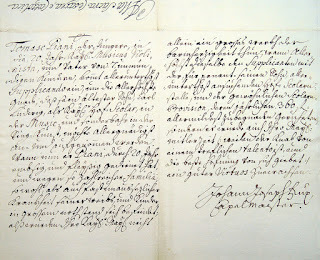 Johann Joseph Schnitzenbaum died on 5 October 1683 in the house of Martin Tattenrieder (1618-1683) which was the abovementioned house "Zum schmeckenden Wurm" ("The Tasting Reptile") between Wollzeile and Lugeck where in 1671 one of Schnitzenbaum's children had died. That Schnitzenbaum lived in one of Martin Tattenrieder's two houses was not a coincidence. Tattenrieder's father-in-law Johann Pistorius was Schnitzenbaum's colleague at the Lower Austrian Government and in 1665 Schnitzenbaum's friend Johann Michael Kreitzthaller, the aforementioned barber from Salzburg, had served as witness at Tattenrieder's wedding (A-Wd, Tom. 23, fol. 97v). Johann Joseph Schnitzenbaum's obsequies took place at the Cathedral. He was buried in the crypt of the Augustinian Church. 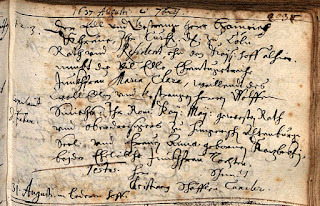 The entry concerning Johann Joseph Schnitzenbaum's obsequies on 5 October 1683 at St. Stephen's. Note the spelling of the word "wollzeile" with the h-like letter that doubles the following "l" (A-Wd, BLB 1683a, fol. 165r). Obsequies. Mr. Johann Joseph Schnitzenbaum, secretary with the Lower Austrian government, according to Dr. Stumpf's certificate was inspected to have died of bloody dysentery in Martin Dattenrieder's house in the Wollzeile, 53 years of age, and was buried in the Church of the Augustinian Friars. 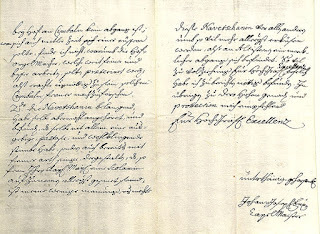 Johann Joseph Schnitzenbaum's probate file is not extant in the holdings of the Obersthofmarschallamt. Johann Joseph Fux's niece Maria Fux died on 6 April 1773 at 7 a.m. at the "Adelsburgisches Hauß N. 455. beÿ St. Salvator" (A-Wsa, TBP 67/II, FVU, fol. 13r). At that time she had been living "von eigenen Mitteln" (on her own resources) which means that her livelihood was based on bank shares that had come from Fux's and Maria Theresia Schnitzenbaum's estates. 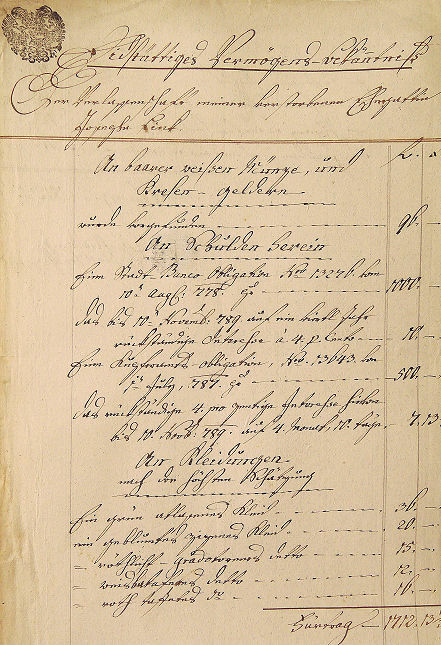 Köchel published no further details from Maria Fux's probate file, except the following numbers that he considered to describe the final amount of money that the universal heiress received ("demnach blieben der Erbin", Köchel, 292). The amount, that Köchel considered the net inheritance of Maria Fux's foster daughter Josepha Perger, is wrong. 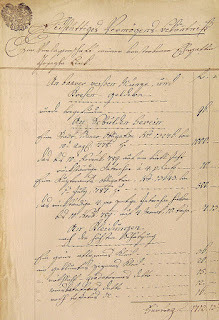 Köchel disregarded the fact that the supposedly final amount of 10,149 fl 8 x was still subject to a 10% inheritance tax of 1,014 fl 54 x which reduced Perger's net inheritance to 9,134 fl 14 x. Maria Fux's probate file consists of 43 pages of which Köchel only published two and a half, namely the acknowledgement of receipt which was drawn up on 20 May 1774 in Graz and signed by ten of Maria Fux's Styrian relatives who had inherited 800 florins from the composer's niece. Not only is Köchel's transcription rife with mistakes (Köchel, 292), it is also incomplete, because it disregards the seals and signatures of the eight witnesses who were needed, because all of Maria Fux's Styrian heirs were illiterate and only signed with nine crosses and one circle. It comes as no surprise that, apart from Josepha Perger's declaration of inheritance, Flotzinger limits the material he publishes to Köchel's material and also copies several of Köchel's mistakes. There is no village named "Oberfläding" ("Oberflädling" according to Köchel). The name of the village written in the document is Oberfladnitz. Flotzinger not only claims that the inheritance of the universal heir Josepha Perger amounted to "11776,41 fl" (incorrectly decimalizing the sexagesimal of florins and kreutzer), he also mistakenly describes this amount as being gross and net at the same time: "After the deduction of legacies, expenses and fees the universal heir is left with 11776,41 fl which includes[sic] obligations to pay for Mass endowments, legacies and other things" (Flotzinger, 382). I shall not present a detailed list of mistakes here. Flotzinger's method is yet further proof that publishing a heavily abridged version of an eighteenth-century Sperrs-Relation is always problematic, because it leads to a gross distortion of a historical source. 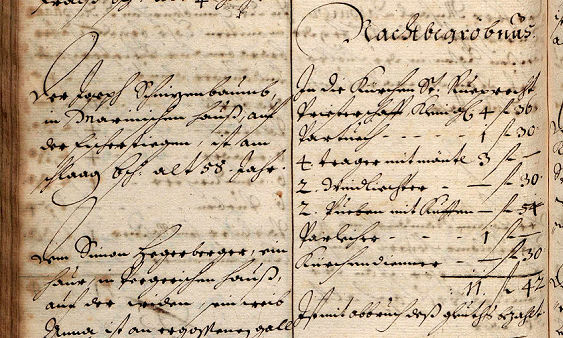 The second page of the receipt, which Maria Fux's heirs signed in 1774, provides a glimpse on the strangeness of the editorial process at hand: none of the witnesses was considered important enough to be included in Köchel's and Flotzinger's edition of this document. 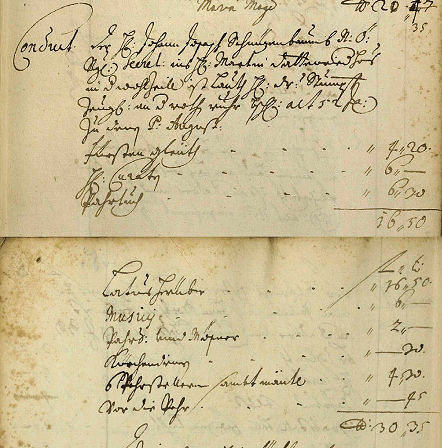 The second page of the receipt of the "Fuxische Freundschaft" in Graz (A-Wsa, Alte Ziviljustiz, 217/82). 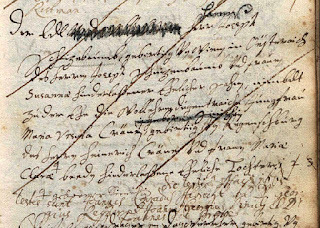 All the signatures of the witnesses beside the seals are missing from Köchel's and Flotzinger's transcription. Franz Anton Reitter, "grundobrigkeitlicher Administrator"
Flotzinger's edition of Maria Eva Fux's will is plagued by additional problems. Like Köchel's edition it is fragmentary and marred by a number of mistranscriptions and typos that show the carelessness that this supposedly "minor source" was treated with. The worst mishaps are: "Freundschafft", "Taßend", "numehro", "Bak-Obligationen" and "Landstaffts". Flotzinger's "Frau v. Vittelbach", who appears in paragraph nine of the will, is actually Frau [Maria Anna] von Dittelbach (the surname "Vittelbach" does not exist). The supposed name of the first witness "Stöckl von Gerburger" is a mistake that was copied from Köchel. This privy counselor's name was Ignaz Xaver Stöckl von Gerburg (b. 6 April 1717 in Passau, d. 17 July 1779 in Vienna). The second witness of Maria Fux's will was her physician Franz Pachner (b. 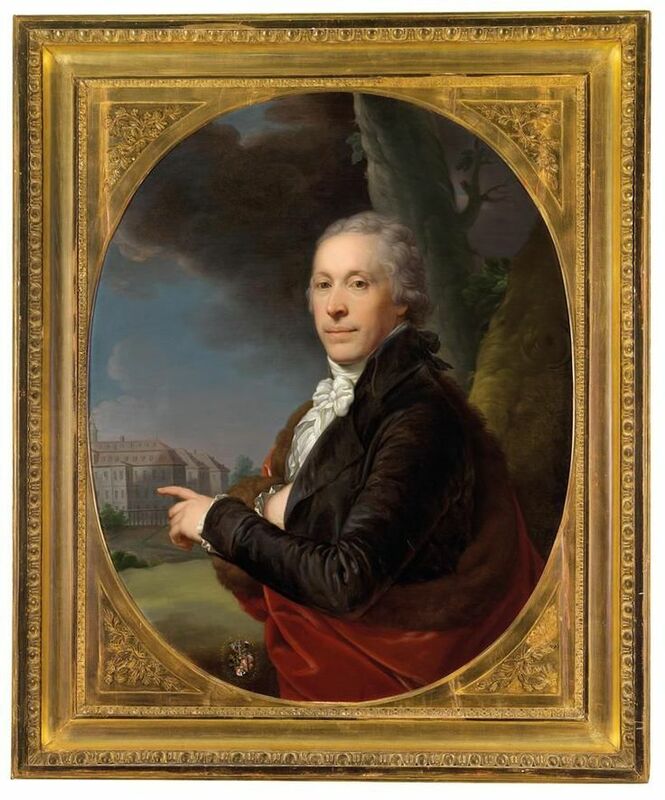 28 January 1718 in Bad Leonfelden, d. 14 January 1777 in Vienna), a member of the Pachner von Eggenstorf family, whose nephew in 1790 was granted knighthoood and in 1793 founded the Neusiedler paper factory. For the sake of historical significance alone, Maria Eva Fux's probate file and will should be published in their entirety. 144 years after Köchel we should be able to raise our scholarly aspirations to more than excerpts and summaries of Fux documents. The fact that in her will Maria Fux still used her uncle's seal matrix, has previously been overlooked by Fux scholars. The most beautiful and best-preserved impression of Fux's seal was created thirty years after the composer's death. In her will Johann Joseph Fux's niece Maria established two mass endowments. 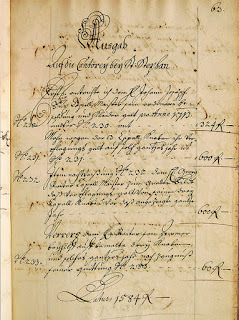 The deed of the first one, which comprised the establishment of a fund of 1,300 florins for the reading of a weekly Mass on every Monday at the parish church of St. Marein near Graz, was partly published by Köchel (Köchel, 292f.). 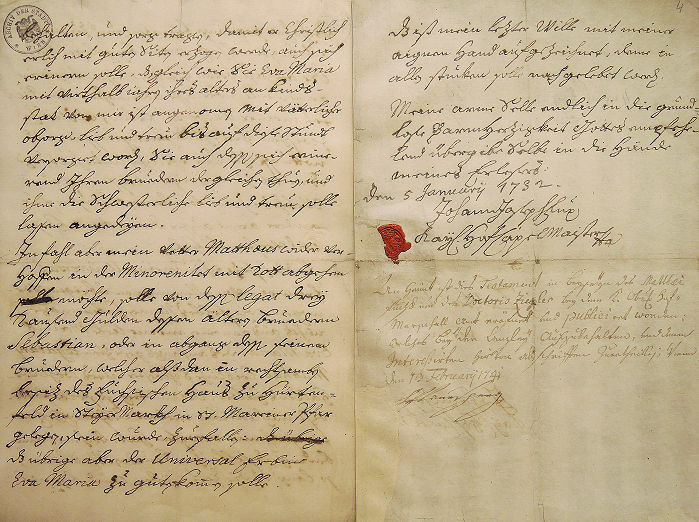 Because in Köchel's book the excerpts of Maria Fux's probate file are followed by this Mass endowment deed, Flotzinger assumed that this document was part of Maria Fux's Sperrs-Relation and he refers to the fact that he could not find it in the probate file with the note "da nicht aufgefunden" (Flotzinger, 382). 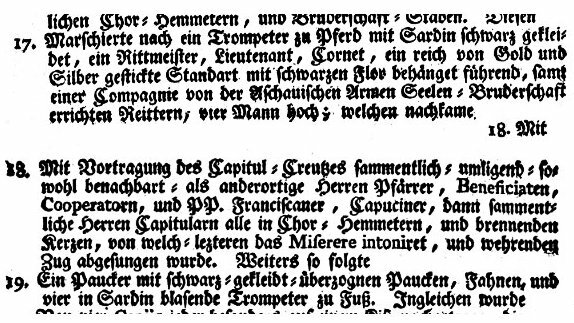 It could not be found there, because endowment deeds are part of a different archival holding, namely the Bestand 1.2.4.7.1 - Stiftungen allgemein | 1525-21.Jh. in the Vienna City Archive's Sonderregistraturen (special registries). 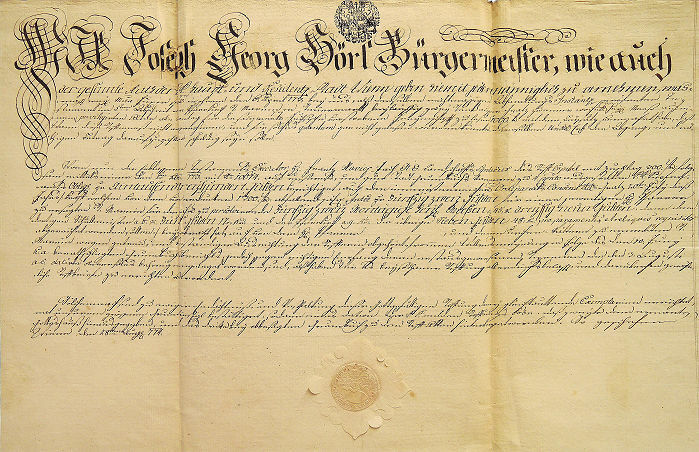 The original of Maria Fux's Mass endowment deed shows that Köchel published a heavily cut version of the document. Köchel may already have foreseen Eduard Hanslik's point of criticism that in his book most of these documents, although of very little interest to 19th-century music historians, are quoted much too extensively: "But where diligence and accuracy go so far that almost whole archives are being printed verbatim, admiration easily changes into horror." (Hanslik in the Neue Freie Presse of 31 October 1871). Because Köchel not only cut the second paragraph of the endowment deed, but also committed several transcription mistakes and modernized the spelling, I present a complete transcription of the document's original text. der gesamte Rath der Kaÿl: Königl: Haupt= und Residentz=Stadt Wienn geben hiemit jedermänniglich zu vernehmen, was mass[en] weÿl: Ma[ri]a Fuxin seel: in ihrem den 6: April 773: beÿ uns, alß derselben rechtmässigen Abhandlungs Instanz eröfneten Testament im 5ten Abschnit der Pfarrkirch St: Marein in Steuermarkt beÿlaufig zweÿ Stund ausser Gratz zu einer wochentl[ichen] heÿl:[igen] Meeß auf einem privilegirten Altar alle Montag für die sammentl:[iche] Fuchsische verstorbene Freÿndschaft zu lesen 1000: f mit dem Beÿsatz verma[c]het habe, daß Wann diese Stiftmeeß nicht angenommen, und für solches quantum gar nicht gelesen werden könnte, deroselben Uni[iver]sal Erb den Abgang, und nöthigen Betrag daraufzuzahlen schuldig seÿn solle. Wann nun der Erblasserin Testaments Executor H: Frantz Xavier Pach N:Ö: Landschafts Syndicus das Stift Capital mit zuschlag 300: f: folgsam mittels einer den 1te[n] Xbr: 773: mit N° 10614: auf unseres, und g[e]m[eine]r Stadt Grundbuchs Kammer zu 4: pcnto ausgestellter K.K. 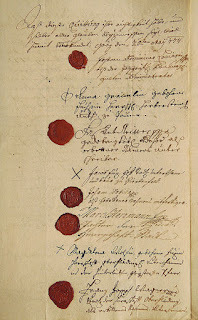 Kupferamts Oblig[ation] pr aintausend dreÿhundert Gulden berichtiget, auch den innerösterreicher[sch]en Ordinariats Consens dd° Gratz 20te[n] Julÿ dieß Jahrs |: kraft welchem von dem von erdeutten 1300: f: abfallend jährl: Inte[ress]e pr fünfzig zweÿ Gulden für einen jeweiligen H: Pfarrer zu ersagten St. Marein für die jährl[ich] zu persolvirenden fünfzig zweÿ montägige heÿl: Meeßen a: 45: x. dreÿssig neun Gulden, dann dem dortigen Schullmeister a: 6: x. fünf Gulden 12: Kr: und der Pfarrkirch a: 9: Kr: die übrige[n] sieben Gulden 48: Kr: pro paramentis et reliquis requisitis abgereichet werden sollen :| beÿgebracht hat, auch von dem Herrn Pfarrer [....] und deren Kirchen=Vättern zu ermeldten St: Marein wegen getreu und beständiger Ausrichtung der Stifterin obgehört frommen Willensmeÿnung in Folge des den 10: Junÿ h:[uius]a:[nni] berathschlagten Grundbuchsberichts, jedoch gegen richtigen Empfang deren erstausgewiesenen Stipendien die den 3: Augusti a:[nni] c:[urrentis] datirte Reversales behörig eingeleget worden sind, alß haben Wir es beÿ sothaner Stiftung allerdings belass[en] und darüberhin gewöhnliche Stiftbriefe zu errichten verordnet. Because Maria Fux's second Mass endowment, the one to the Theatines' Convent in Vienna, was not published by Köchel, it remained unknown to Fux researchers. This is incidental proof that since Köchel no intensive research has ever been done by Fux scholars in Vienna's archives. Maria Fux's second Mass endowment was based on a copper share worth 1,300 florins and was supposed to fund a weekly mass on the weekday on which the foundress of the endowment was to die. This day (6 April 1773) turned out to be an "Erchtag" (Tuesday). auch der gesamte Rath der Kaÿl: Königl: Haupt= und Residentz= Stadt Wienn geben hiemit jedermänniglich zu vernehmen, was mass[en] weÿl:[and] Maria Fuxin seel: in ihrem den 6: April 773: beÿ uns, Als derselben rechtmassigen Abhandlungs Instanz eröfneten Testament im 4tn Abschnied den wohlehrwürdigen P:P: Theatinern allhier beÿ dem heÿl: Kajetan an der hohen Bruken zu dem Ende aintausend dreÿhundert Gulden vermachet habe, auf daß eine wöchentl: heÿl: Meeß für sie auf einem privilegirten Altar jedesmahl an dem Tag ihres Hinscheidens gelesen werde solle. 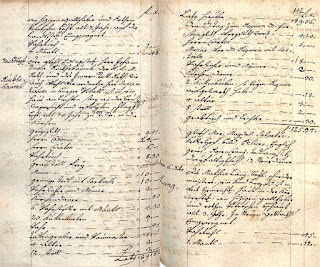 Wann nun von der Erblasserin Testaments Executore H: Frantz Xaverio Pach N:Ö: Landschafts Syndicus das Stift Kapital mit zuschlag 300: f: folgsam mittels einer den 1: Xbr: 773: auf unseres, und g[e]m[eine]r Stadt Grundbuchs Kammer zu 4: pcnto mit N 10615 ausgestellt, und dorthin erlegten K.K. Kupferamts Obl. [igation] pr 1300: f: berichtiget, und von wohlernannten P:P: Theatinern nach von hochlöbl[icher] N:Ö: Reg: den 24: März dieß Jahrs erfolgten Bestätigung die hochfürstl: Geistl:[ichen] Bewilligung den 8tn April darauf bewürkhet, auch in Folge des von uns den 10ten Junÿ a:[nni] c:[urrentis] berathschlagte[n] Grundbuchs Berichts die den 1te[n] dieß gefertigte Reversales |: kraft welcher die Wochentl: Heÿl:[ige] Meeß jedesmahl an einem Erchtag auf einem privilegirten Altar zu der Stifterin frommen Intention gelesen werden sole :| eingelegt worden sind; Alß haben Wir es Inhalt erstangezogenen Grundbuchs Berichts beÿ sothaner Stiftung allerdings belassen, und darüberhin gewöhnl:[ich]e Stiftbriefe zu errichten verordnet. The Theatines' Convent at the Hohe Brücke in Vienna (colored engraving after Salomon Kleiner). In the chapel of this convent Mozart and his bride on 2 August 1982 went to their prenuptial confession. It is not known when the Mass endowment for St. Marein was discontinued. The endowment for the Theatine Friars probably ended when in 1782 the convent was closed by Joseph II. Maria Fux's universal heir (and thus the eventual sole heir of Johann Joseph Fux's estate) Josepha Perger was born on 8 November 1744 in the Lower Austrian village of Guntersdorf, daughter of the "Herrschafts-Regent" Joseph Perger and his wife Eva Theresia. It is not known why at that time her parents were staying in the country, but her mother seems to have had relatives in Guntersdorf. Joseph Perger's two other children Anton Wenzel (b. 1750) and Maria Elisabeth (b. 1752) were born in Vienna. Perger obviously became an orphan at a very young age which lead to her adoption by Maria Fux. 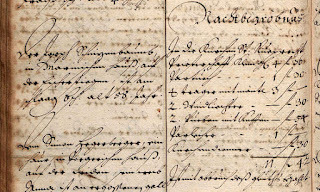 The entry concerning the baptism of Maria Josepha Perger on 8 November 1744 in Guntersdorf. 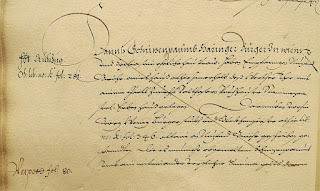 Her father Joseph Perger is given as "dermahliger Landtgerichtsverwalter", the godmother was Eva Theresia Wurtz, "Verwalterin in dem Johannes Hof zu Wienn" (Pfarre Guntersdorf, Tom. 3, p. 76). Köchel gives a short list of successors to Fux's estate ("Vererbung des Vermögens des Joh. Jos. Fux", Köchel, 293), but not only are several of Köchel's dates wrong, he also failed to observe the decrease of Fux's assets in the course of their transfer to subsequent heirs. 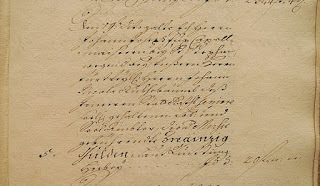 After having signed a marriage contract on 28 August 1774, which included a mutual appointment as one's heir, Josepha Perger, on 16 October 1774, married Johann Elias Linck, a head cook in the service of Count Kolowrat-Liebsteinský (Köchel's claim that this wedding took place in September 1774 is wrong). 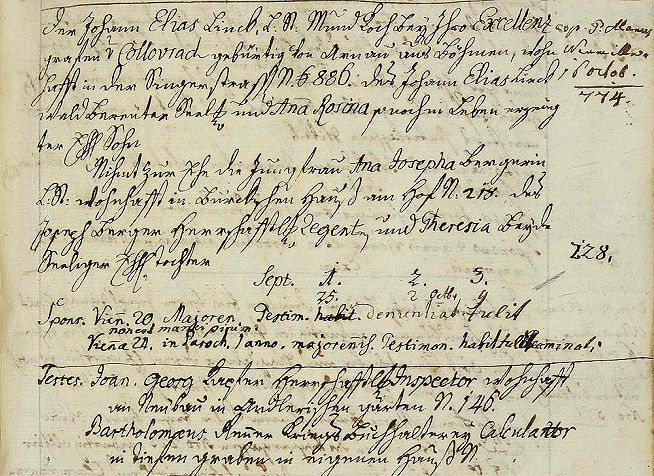 The entry concerning the wedding of Johann Elias Link and Joseph Perger on 16 October 1774 at the Schottenkirche. Note the dates of the three publications of the banns: September 25th, October 2nd and October 9th. The groom hailed from Arnau (today's Hostinné) in Bohemia and lived at the "K.K. Bancohaus" (today Singerstraße 17-19) (A-Ws, Tom. 34, fol. 51r). On 16 October 1789 Josepha Link died of a stroke (the date given by Köchel is wrong) and was buried three days later in the St. Marx Cemetery. 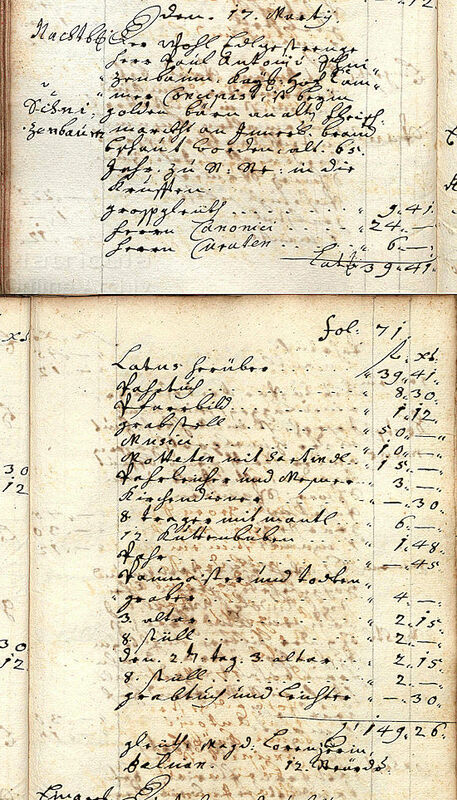 The list of Josepha Link's assets in her probate file shows that in 1789 a bigger part of her inheritance was already gone. What was left were a 1,000 fl. bond of the "Stadt-Banco" and a 500 fl. "Kupferamts-Obligation". On 1 July 1790 Johann Elias Link married again (the date of this wedding given by Köchel is wrong). His second wife was Maria Theresia Nimpfling, born 12 April 1761 (Graz, St. Peter Tom. 4, p. 377), daughter of a "Tabak-Amts-Officier" in Graz. 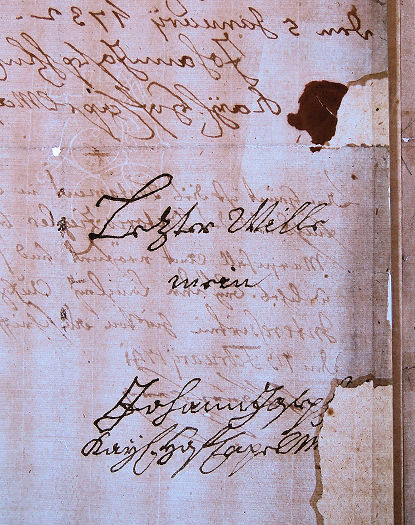 By the time of Johann Elias Link's death on 24 March 1792 the assets from Maria Fux's estate had been gone. In Link's probate file a copper bond of 250 fl. is listed as deposit of the Schnitzenbaum endowment. Some items in Johann Elias Link's estate nourish the fascinating conjecture that they could still have come from the personal property of Johann Joseph Fux: two old silver shoe buckles, an old golden pocket watch with double glass and varnished casing and an old sword with a silver hilt. On 18 August 1793 (Köchel's date is again wrong) Johann Elias Link's widow married the merchant Michael Anton Constantin (b. 2 February 1767). This chronological sequence of inheritance is of little relevance to Fux research. Its only significance lies in the previously unknown fact that Michael Constantin was an older brother and (as of 1796) guardian of Magdalena Constantin who was Johann Nestroy's mother. 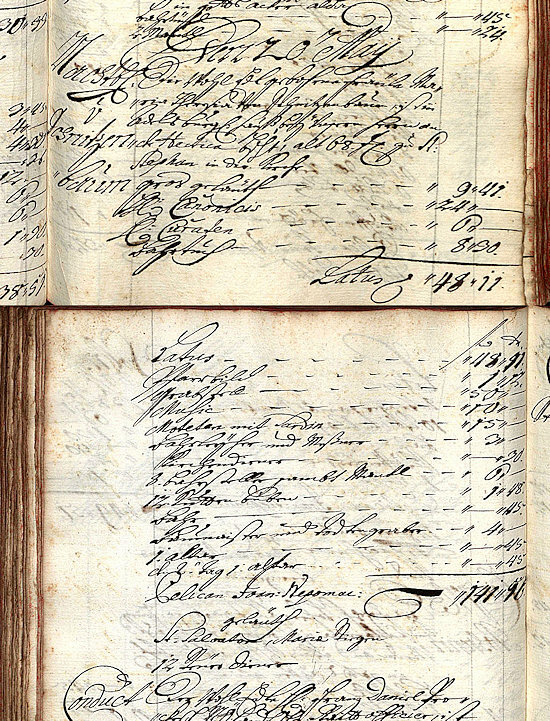 Josepha Perger's long-time heirs had no financial profit from the inheritance. They only kept the right to appoint the beneficiary of Maria Theresia Schnitzenbaum's charitable endowment of four florins and 30 kreutzer per month to a resident of Vienna's St. Johannes Nepomuceni Spital. This endowment will be dealt with below. 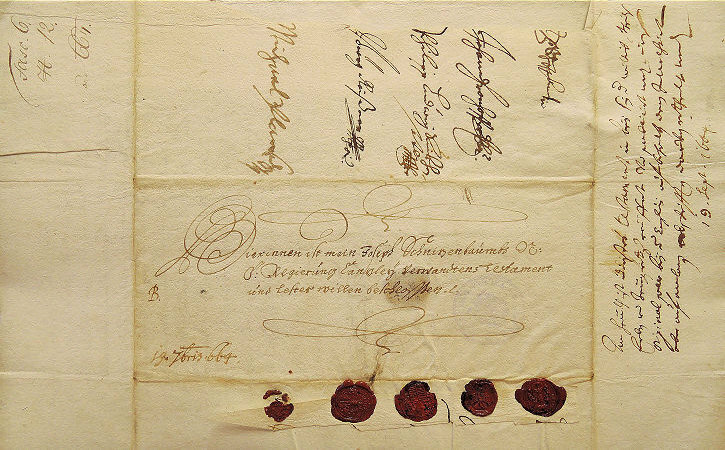 On 16 September 1743 Fux's sister-in-law Maria Theresia Schnitzenbaum drew up and signed her will. Parts of this document were published in 1872 by Köchel (Köchel, 295). Flotzinger also presents a fragmentary edition of this document (Flotzinger, 379] and not surprisingly manages to botch it in several different ways. First, he falsely describes it as being held by the Niederösterreichisches Landesarchiv in St. Pölten, while it is actually a part of the remains of the files Lower Austrian Landrecht in the Austrian State Archives which were heavily decimated in the 1927 fire at the Palace of Justice. The first page of Maria Theresia Schnitzenbaum's will which she signed on 16 September 1743 (OeStA, AVA Inneres NÖLR Test 186). Because this document in 1927 suffered heavy water damage, in the course of restoration it was completely covered with Japanese paper. 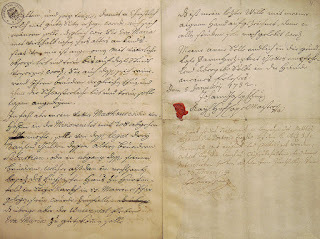 Because (possibly owing to her extraordinary wealth) Maria Theresia Schnitzenbaum was erroneously considered a noblewoman, her probate file and will ended up in the holdings of the Lower Austrian Landrechte Court. The correct shelfmark of Schnitzenbaum's will is A-OeStA/AVA Inneres NÖLR Test 186 (Karton 4, fol. 160-67). Second, Flotzinger, showing unwillingness to go any further than Köchel, only presents three paragraphs of the will which actually consists of nineteen paragraphs. There is no obvious reason to suppress a large part of Maria Theresia Schnitzenbaum's various legacies which are of significant historical interest, such as her Mass endowments to the Convent of St. Nikolai, to the Wiener Herberg and her other pious bequeathments to various clerical institutions. Not surprisingly Flotzinger's supposedly updated transcription of the document is flawed: "derfe" was misread as "diesse", "köne" as "sölle" and "in" as "sie" (to name only the gravest mistakes). 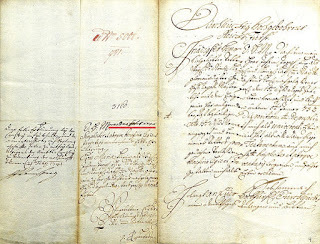 Matthäus Theophil Fux's 1749 "Erbseklärung[sic]" (declaration of inheritance) to the estate of Maria Theresia Schnitzenbaum, which Flotzinger describes as "dzt. unauffindbar" ("currently untraceable", Flotzinger, 379), was part of Maria Theresia Schnitzenbaum's probate file at the Landrechte Court. It cannot be located, because it was destroyed in the 1927 Palace of Justice fire. If Flotzinger had looked for this document at the right place, he would have realized this. 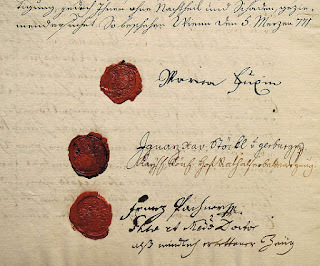 In paragraph twelve of her will Maria Theresia Schnitzenbaum established a charity endowment of 1,500 florins to the St. Johannes Nepomucenispital, an almshouse in the Viennese suburb of Landstraße. The interests of the endowment were to be used to secure the livelihood of a poor woman who was to be chosen by the foundress's heirs and to be supported with a daily payment of nine kreutzer. The recipient of this charitable endowment received the regulatory free clothing on which she was obliged to carry Maria Theresia Schnitzenbaum's coat of arms. Furthermore the chosen poor woman was obliged to say a daily prayer and to go to confession and attend Communion on every May 19th, the anniversary of the benefactress's death. 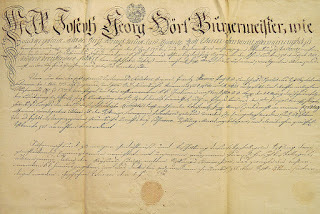 Köchel quotes one paragraph from Schnitzenbaum's endowment deed which he located "among the files of the k. k. Statthalterei in Wien" (Köchel, 296). This copy seems to be the one that today is held by the Lower Austrian Provincial Archives in St. Pölten (Allgemeine Pergament-Stiftbriefsammlung Nr. 242 [Karton 9]) from which Flotzinger published a very short passage (Flotzinger, 380). But Flotzinger's text, although it is presented as if it were an original quote, is just a short extract. There is yet another, previously unknown copy of this endowment deed. In March 1841 a copy of the original was made for the municipal administration which survives in the Vienna City Archive's collection of endowment deeds (A-Wsa, Sonderregistraturen, Stiftungen, A2/5341). The complete text of this document is herewith published for the first time. Viertens: das hievor angeregte Stifftungs Capital pr: Ain Tausend fünff Hundert Gulden von vorgangs benannter Universal Erbinn Eva Maria Fuxinn vermittels einer Statt Banco Obligation untern Dreÿzehenten Februarij dises zu endstehenden Jahrs an das Spittal St: Joannis Nepomuceni mit der Verordnung richtig abgeführet worden, daß selbes alljährlich bey dasiger [fol. 2r] Spittals=Haubt=Rechnung besonders in Empfang und Ausweisung gebracht, auch auf das aller vorsichtigste, wie es immer die menschliche Kluegheit zulasset administriret und genossen werden solle. Wann nun dise Stifftungs-Sach von unserer N.Ö. Repraesentation und Cammer nach Verrechnung der zur Besorgung dieses Spittals Versammleten Congregation behörig untersuchet und befunden worden, daß sothane fromme Stifftung zu Vermehrung Christlicher Barmherzigkeit und höchst erwünschlicher Versorgung deren allhiesig Statt=Armen gereiche das hirzu gewidmete Capital auch zur unterhalt eines Armen allerdings zuelänglich sey, mithin wir in ausfertigung des gebettenen Stüfft=Brieffs gnädigst gewilliget, und die beregte Stüfftung in unseren allerhöchsten Schutz genommen haben. Solchemnach Befehlen wir hiemit gnädigst, und wollen, daß über angezogene Stüftungspuncta festiglich gehalten, zu dem Ende dises Stiftbriefs drey gleichlauthende Exemplaria aufgerichtet hirvon eines bey unserer Closter=Raths=Registratur verwahrlich aufbehalten, das andere widerhohlten St. Joannes Nepomuceni Spittal extradiret auch daselbst in dem Stifftungs-Protocollo ordentlich eingetragen das dritte aber der Stifterinn Universal=Erbinn zu ihrer guten Versicherung ausgehändiget werden solle. Thuen dieses hirmit auch wissentlich mit Urkund dises Brieffs der mit unseren Landesfürstlichen Insigl [fol. 2v] Bekräfftiget und gegeben ist. Wienn den Sechs und Zwanzigsten Juny des Sibenzehen Hundert Fünfzigsten Jahrs. Collationirt ex offo: und ist diese Abschrift dem in der Regierungs Stiftungsbrief-Samlung sub N° 242 aufbewahrten original Stiftungsbrief wörtlich gleichlautend. Wien den 23ten März 841. Maria Theresia Schnitzenbaum's charitable endowment existed way into the late 19th century. 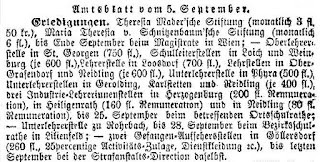 The last referrence to its bestowal, that I could find in an Amtsblatt, appeared on 6 September 1878 in the newspaper Die Presse. 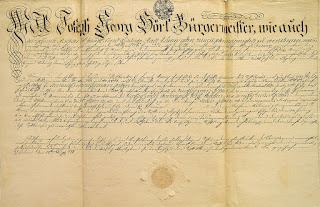 According to the 1898 Kataster der in Niederösterreich verwalteten weltlichen Stiftungen nach dem Stande des Jahres 1893 in that year the Schnitzenbaum endowment had financial assets of 1,915 florins and an annual profit of 78 fl. Flotzinger's article about Fux's life is fraught with more small, not easily noticeable mistakes of which only a few can be addressed here. To identify houses in late seventeenth-century Vienna, Flotzinger relies on Johann Jordan's book Schatz, Schutz und Schantz deß Ertz=Hertzogtumbs Oesterreich (Vienna: van Ghelen, 1701). But since this book merely consists of a listing of houses and their owners according to a virtual walk through the city, it is unreliable and cannot be used to exactly determine the modern location of individual buildings. 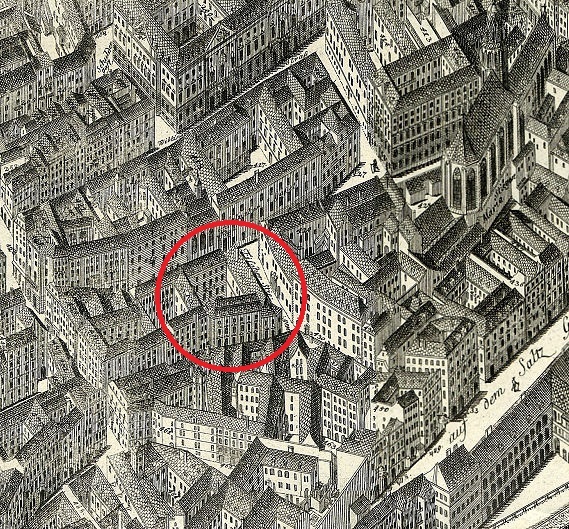 Thus Flotzinger is unable to locate the "Winklerisches Haus" where Fux's bride lived in 1698 (Flotzinger, 38). Flotzinger's statement "Winklerisches Haus" offenbar irrig statt Winkherisch, gegenüber dem Lorentzer Gäßl" is false, because not only is Jordan's name "Winkherisch" wrong, this house is also not located opposite the Laurenzergasse. It is the house "Zur Maria Hilf" (today Fleischmarkt 9, last conscription number 704) which, as of 1693, was owned by the merchant Johann Niklas Winkhler and his wife Maria Apollonia, née Weigl, widowed Wendtenzweig. Empress Amalia's Kapellmeister Heinrich Holzhauser was not born "c.1685" (Flotzinger, 60), as given in the notoriously flawed Österreichisches Musiklexikon. Holzhauser was born on 10 July 1675 in the Lower Austrian village of Wilfersdorf (Pfarre Wilfersdorf, Tom. 1, 75). He died on 8 March 1726 in his house Stadt 1061 in Vienna. Otto Heinrich Ponhaimer's first name was not "Johann" (Flotzinger, 60). Flotzinger's transcription of the entry in the 1773 records concerning the death of Maria Fux is flawed (Flotzinger, 381). The word "wo[n]ach" makes no sense and actually reads "word[en]". 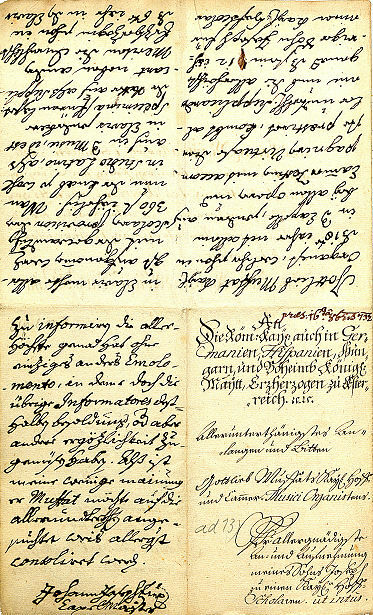 The mysterious initials "AH" in this entry, that Flotzinger adorns with a question mark, refer to the municipal coroner Anton Hochmayr. The merchant Johann Baptist Muffat did not get married in September 1691 in the Schottenkirche. Flotzinger mistook the entry concerning the publication of the banns in the records of the Schotten parish for Muffat's marriage entry. Muffat's wedding actually took place on 19 August 1691 at St. Leopold's Church (St. Leopold, Tom. 1, 484). A number of curious oversights suggest that Flotzinger's text never underwent a thorough proofreading process. Botched wordings such as "eine Gedenktafel wurde an Fux angebracht" (12) and "Fuxens zweites Ansuchen von Fux" (364) are not supposed to pass a meticulous editing process. This also applies to the misplaced Latin name "Joannes Fux Styrus Hirtenfeldensis" (368), the repeated misspelling of Köchel's name as "Koechel" (363f., 367), and the curious use of an ampersand in italic Garamond (&) in the title of the journal Music & Letters (412). Flotzinger repeatedly refers to Joseph Sonnleithner as "Joseph von Sonnleithner". Unlike his brother Ignaz and his nephew Leopold, Joseph Sonnleithner was not ennobled. The authors could not agree on the German genitive for Fux's name – Flotzinger prefers "Fuxens", while his colleagues use the word "Fux'". This can be considered an amiable variety. As far as the edition of documents from Fux's life is concerned, the somewhat unsatisfactory state of Fux research needs no further comment. The situation is reminiscent of O. E. Deutsch's flawed and completely out-of date edition of Mozart documents which will not be replaced by better work in the near future, because the people in charge (and the ones holding the purse strings) are unable to realize the seriousness of the situation. I have repeatedly addressed this particular problem on this blog, a problem that of course is not limited to historical musicology. An annoying phenomenon in the field of humanities is the fact that there is no reliable authority which is qualified to do a vetting process of palaeographic work on a general academic level. Only too often the scientific institutions that are supposed to teach transcription skills and expertise on archival sources, show themselves to be unable to even assess the skills of their own graduates. Scientific projects, that are funded by major institutions like the Austrian Science Fund and are based on the transcription and study of historical sources, are never even once are faced with a thorough vetting process, because this kind of quality management would not only overburden the sponsor's ressources, the funding institution would also at some point have to rely on outside experts (and possible applicants) whose lack of competence is the cause of most problems in the first place. Concerning this kind of projects I have come up with a rule of thumb which describes the problem at hand: to be safe from any quality control (by the sponsor or your peers), try to base your historical research on the transcription of at least of 5,000 files. No evaluation management will then be able to ever check the quality of your work and what you did with your sources. And the same rule – involving much fewer documents – applies to the publication of books. Fux scholars should detach themselves from the influence of Köchel (like Mozart scholars from that of Deutsch), go back to square one and implement the demands of modern editorial practice in their work. A complete edition of all Fux documents should be the first and most important task. For this project the funding that the University of Graz and the State of Styria have already invested in Flotzinger's book will not be available again. A Viennese publishing house, which recently released a new edition of Köchel's Fux Werkverzeichnis, has begun with the edition of a works by Fux (for which I consider the demand very marginal). Considering the astonishing fact that a great number of Fux documents are still unpublished, this publisher would be well advised to also initiate the publication of an up-to-date collection of these sources. This project, however, could be facing problems, because the owner of this publishing firm has shown himself unable to work with independent-minded researchers and is also known for paying academically qualified freelancers an hourly fee of only 15 Euros. A member of the staff of this publishing firm tried to explain this stunning stinginess with "the bad economic situation of the construction industry". Altenburg, Johann Ernst. 1795. Versuch einer Anleitung zur heroisch-musikalischen Trompeter- und Pauker-Kunst. Halle. Auracher, Augustin. 1763. Der Gute Freund des Kaisers; Das ist: Ehren- und Trauer-Rede Weyland Ihro Excellenz des Hochgebohrnen Herrn, Herrn Ignatz Felix Joseph, Des Heil. Röm Reichs Grafen v. Törring und Tengling, auf Jettenbach. Salzburg. d'Elvert, Christian. 1850. Historische Literaturgeschichte von Mähren und Österreichisch-Schlesien. Brünn: Rohrer's sel Witwe. Hochedlinger, Michael. Pangerl, Irmgard. 2004. "Mein letzter Wille". Kulturhistorisch bedeutende Testamente und Verlassenschaftsabhandlungen in Wiener Archiven (16.-18. Jahrhundert). Vienna: Veröffentlichungen des Wiener Stadt- und Landesarchivs, Reihe C, Bd. 10. Flotzinger, Rudolf. 1996. "Der Stand der biographischen Fux-Forschung 1991. Fragen - Antworten - Möglichkeiten". In: Edler, Arnfried. Riedel, Friedrich W. Johann Joseph Fux und seine Zeit. (Publ. d. Hochschule für Musik und Theater Hannover 7). Laaber, 93-110. –––––––. 2015. Johann Joseph Fux. Zu Leben und Werk des österreichischen Barockkomponisten. Graz: Akademische Druck- und Verlags-Anstalt. –––––––. 2015. Johann Joseph Fux. Leben - musikalische Wirkung - Dokumente. Graz: Leykam Buchverlagsgesellschaft mbH. k.k.statische Central-Commission. 1898. Kataster der in Niederösterreich verwalteten weltlichen Stiftungen nach dem Stande des Jahres 1893. Auf Grund der von der k.k.n.ö. Statthalterei gelieferten Nachweisungen. Vienna: Selbstverlag. Knaus, Herwig. 1967-69. Die Musiker im Archivbestand des kaiserlichen Obersthofmeisteramtes, I-III. Wien-Köln-Graz: Kommission für Musikforschung, 7, 8. 10. Köchel, Ludwig von. 1872. Johann Josef Fux, Hofcompositor und Hofkapellmeister der Kaiser Leopold I., Josef I. und Karl VI. von 1698 bis 1740. Vienna: Alfred Hölder. Lorenz, Michael. 2014. Haydn Singing at Vivaldi's Exequies: An Ineradicable Myth. Vienna: Internet publication. Till, Rudolf. 1957. Geschichte der Wiener Stadtverwaltung in den letzten zweihundert Jahren. Vienna: Verlag für Jugend und Volk. My thanks go to Cristina Iordache, Janet Page, Maurizio Tomasi. Francesco Centola, Christine Babelon, Nigel Boon, Kris Steyaert, Wolfgang Oehmicke, Joachim Tepperberg, Georg Gaugusch, Reinhard Gruber and Susanne Claudine Pils for their support during my research for this article.